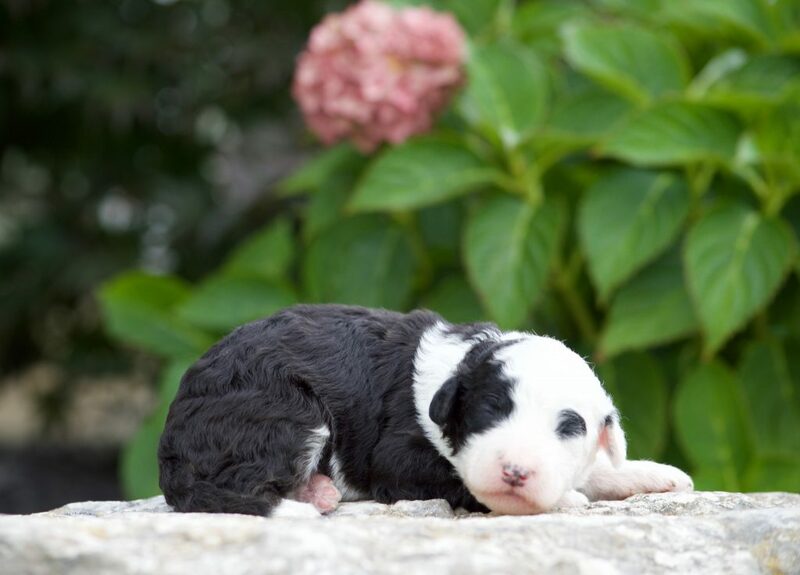 Missy and Wrigley have had another one of their popular litters for us. We have 10 gorgeous pups! 4 Boys and 6 Girls. One boy is on the small side so we are watching him closely. The rest are doing well! 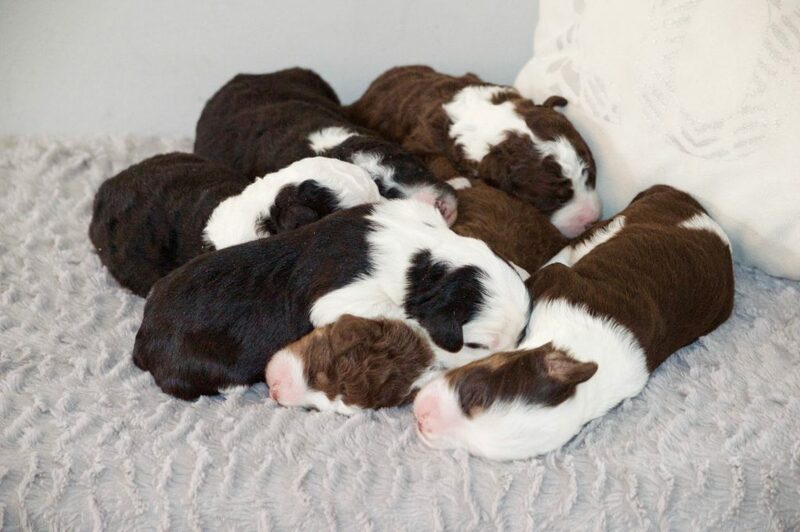 We have some brown and white and black and white pups in this litter. Lots of curly coats! These are excellent for being hypoallergenic. 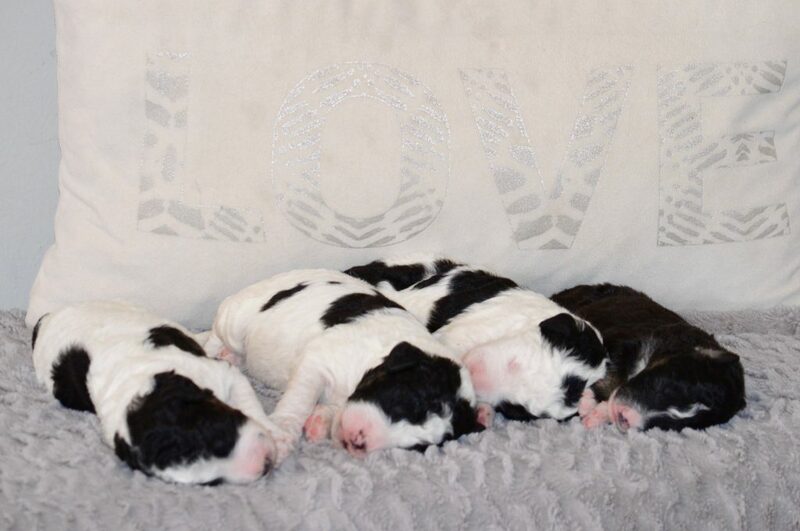 These pups will be ready to go home Friday, May 10, 2019 or after. 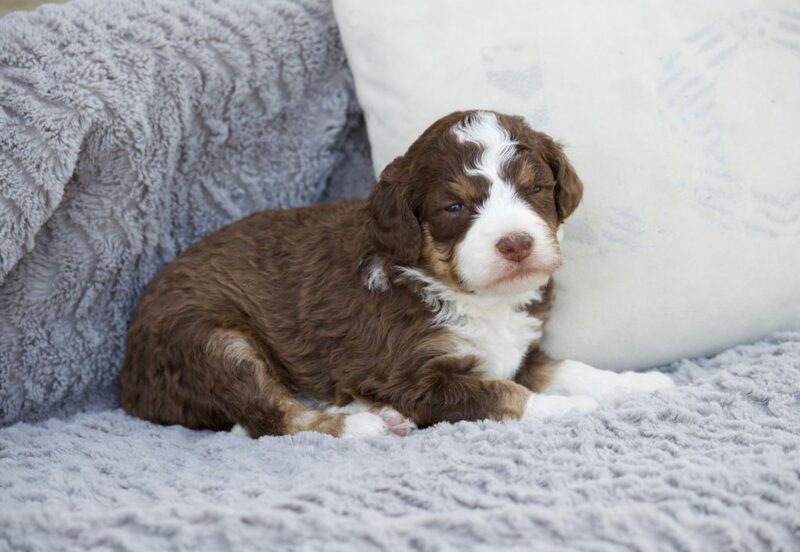 We will plan for puppy picking around 5-6 weeks of age to those who have confirmed to this litter. 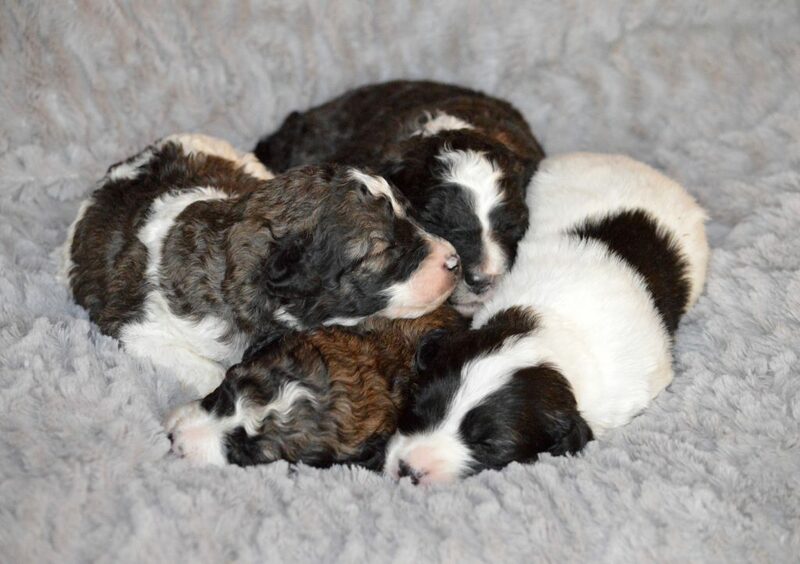 We will go through our waiting list and ask those on the waiting list to confirm a pup or not from this litter. We will update the waiting list on this page as we hear from people. 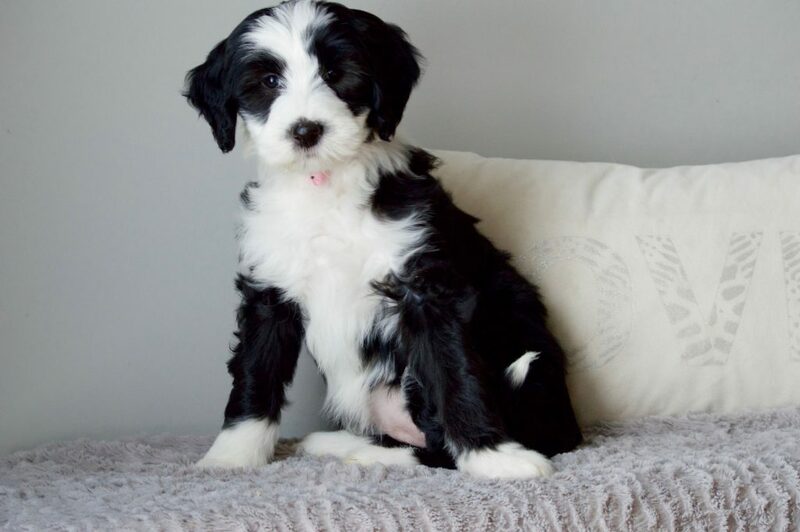 We have quite a few people on our master waiting list for the Moyen Sheepadoodle. Feel welcome to join in on our waiting list. If you don’t get a pup from this litter than your name is in for a future one! 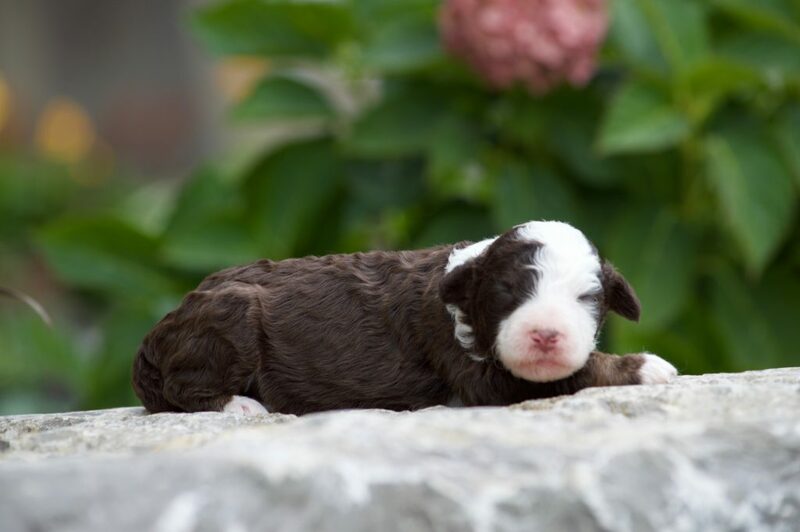 We are planning another litter of Moyens with Piper x Wrigley for mid to end of May 2019. Enjoy a couple photos of some past pups. You can see some on instagram too! 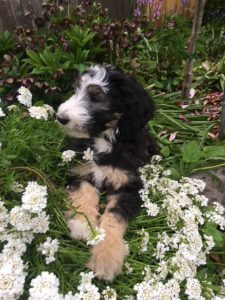 If you scroll down you can see past photos of Missy’s litter and some testimonials from past owners. 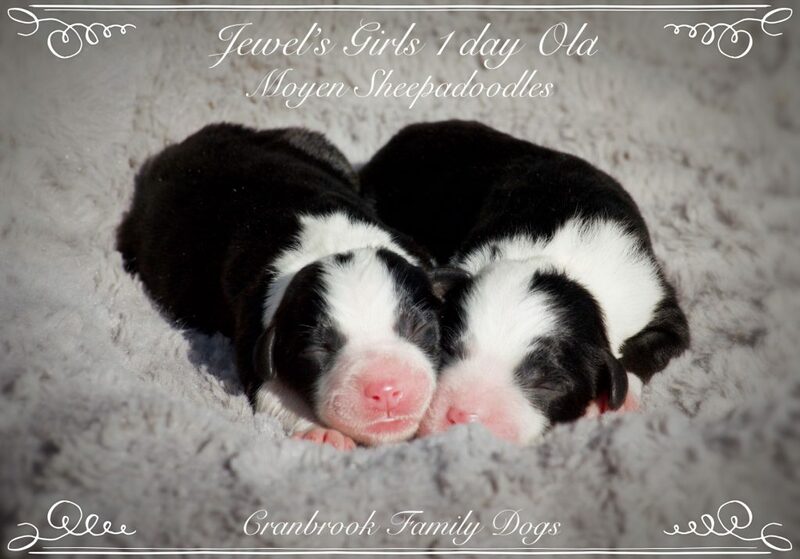 Jewels and Wrigley brought us 10 puppies just before Christmas. What a wonderful gift! Once again we have a nice variety of colours and markings. We have 2 brown boys and 1 brown girl. Then we have some tuxedo coats in our girls and boys and some parti coats in our boys. These pups should mature to around 40 – 45 lbs. 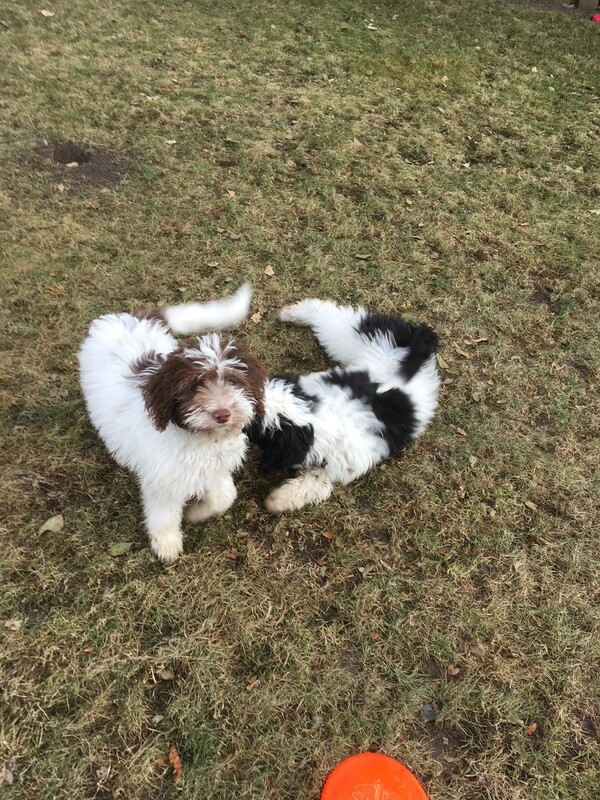 Both Jewels and Wrigley love people, love to get affection and love to play! These pups will have medium to higher energy as pups but will likely mellow out to mild to medium energy after 2 yrs old. These pups are good for people who are active and like to have fun with their dog. They will have low to non shedding coats. 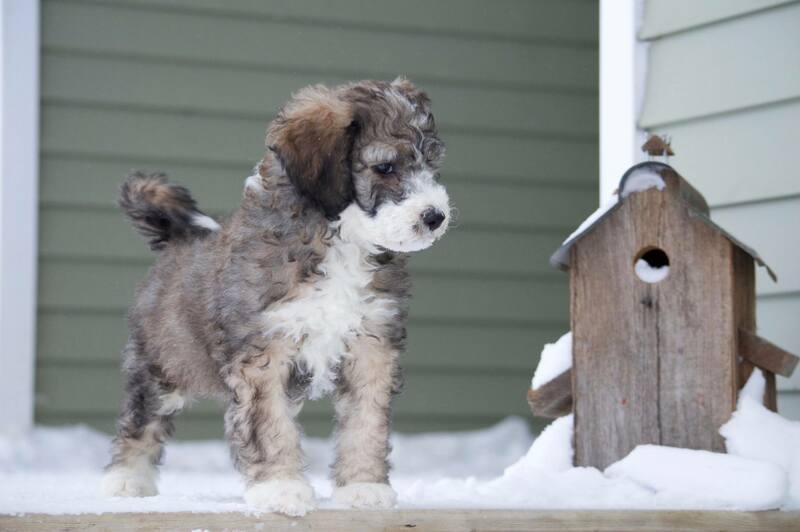 We have some curly coats and some wavy coats. 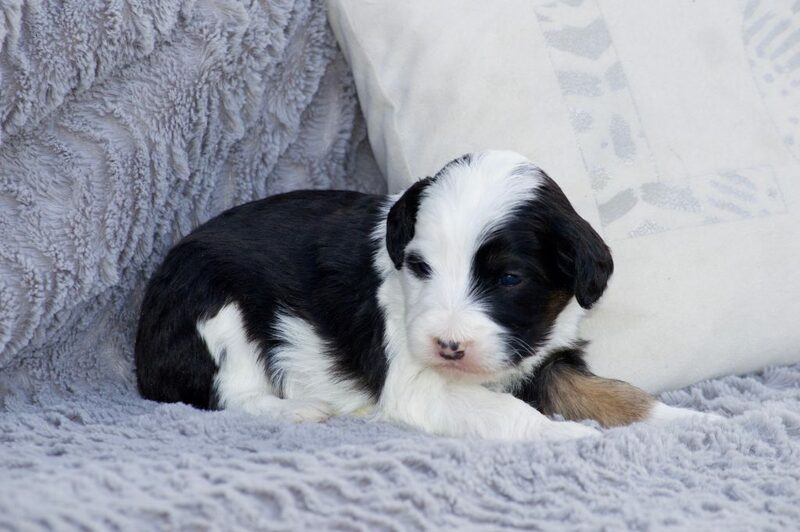 Puppy picking will happen end of January. 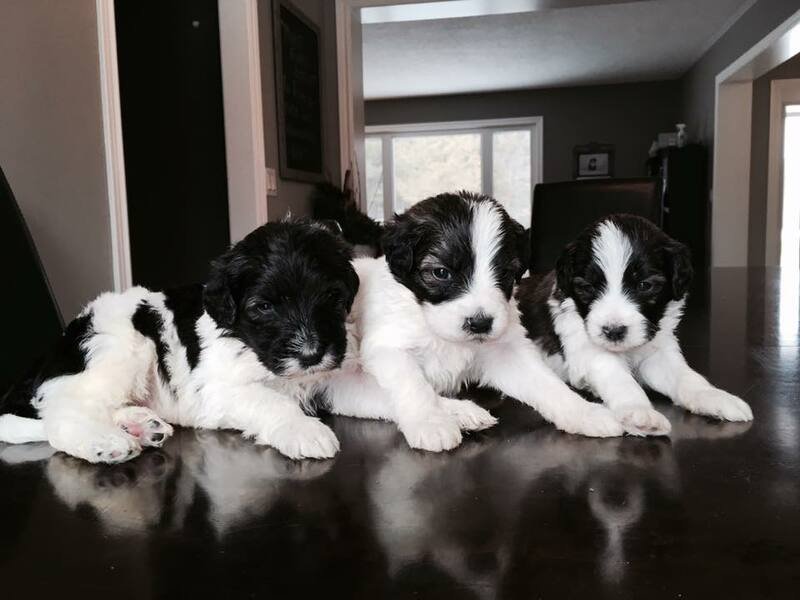 These pups will be ready to go home February 15 or after when they are 8 weeks old and have their first booster. 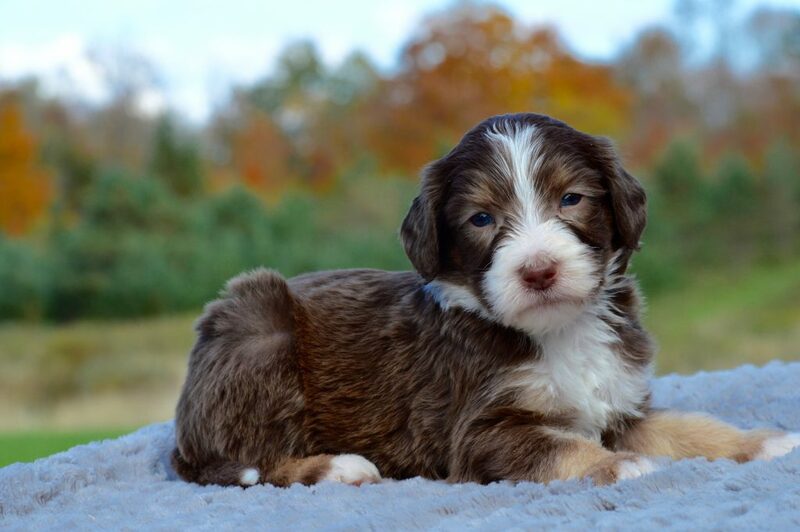 If you are interested in one of these pups, fill out our online puppy application. 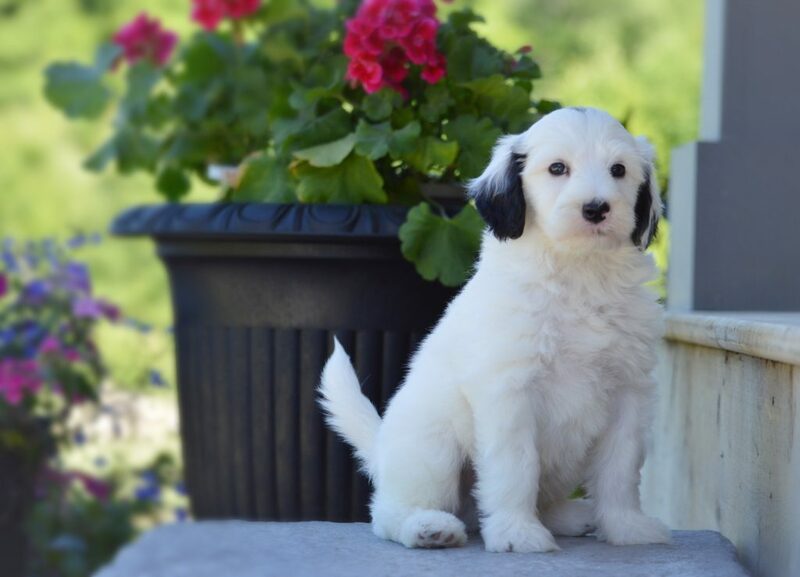 Deposits are $500 to hold a pup to your name on our waiting list. 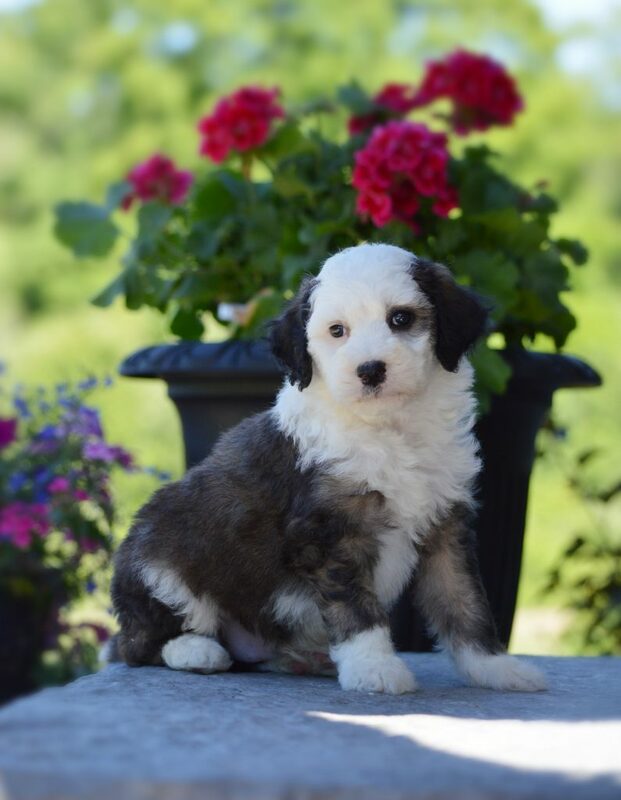 Pictures of puppy shown below are available. The ones chosen already are marked. 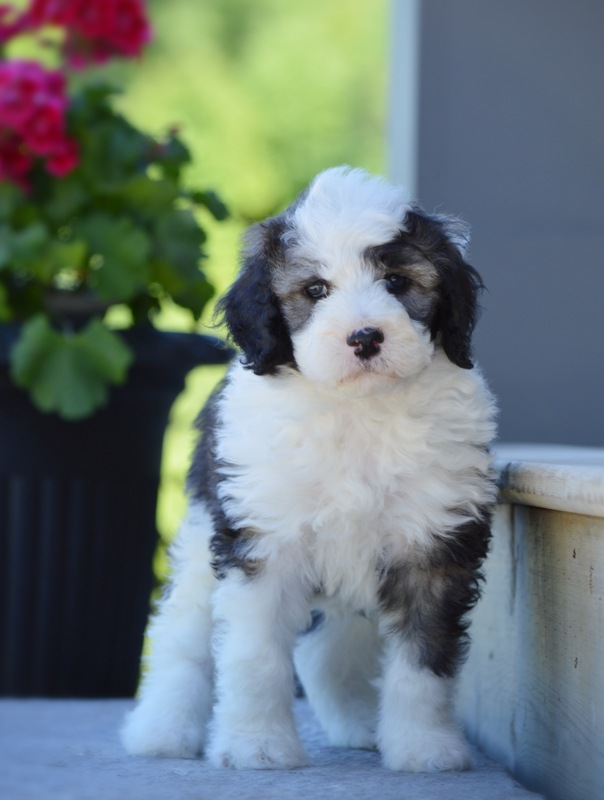 Our Moyen Sheepadoodle pups are priced at $3,000 taxes included. 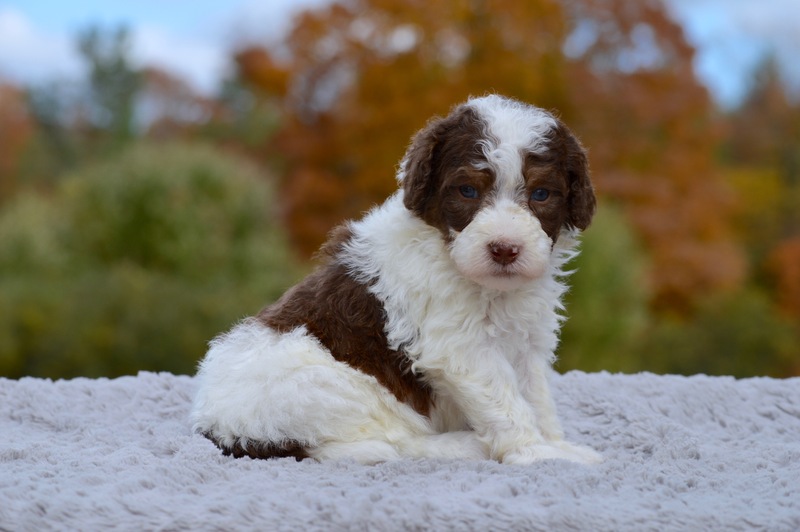 Brown or Merle pups are an additional $500. 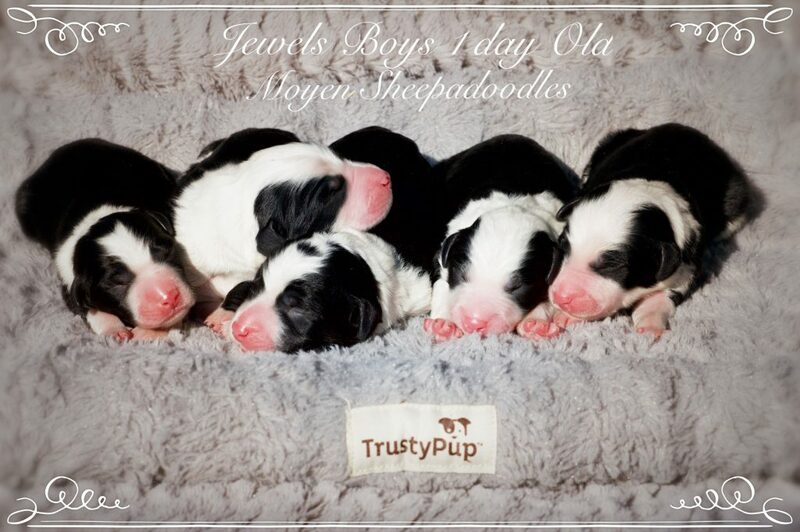 Enjoy these photos of some of Jewels x Wrigley’s past puppies. 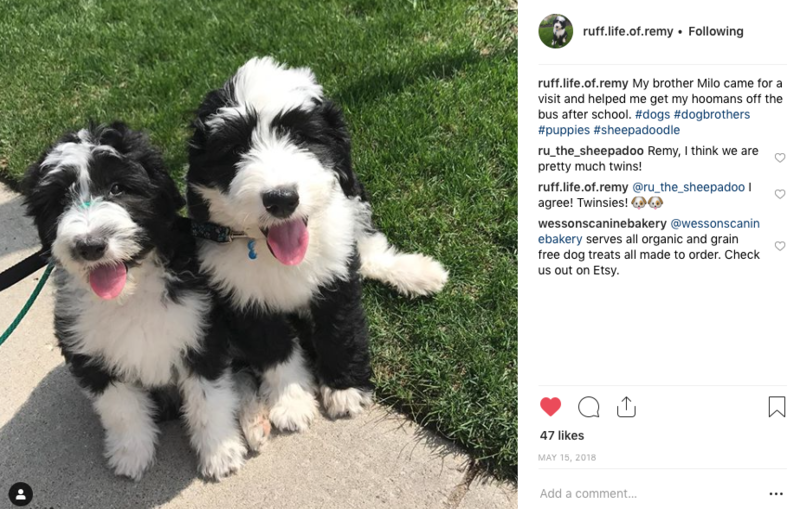 Missy and Wrigley welcome their second litter of F1b Sheepadoodle puppies together. 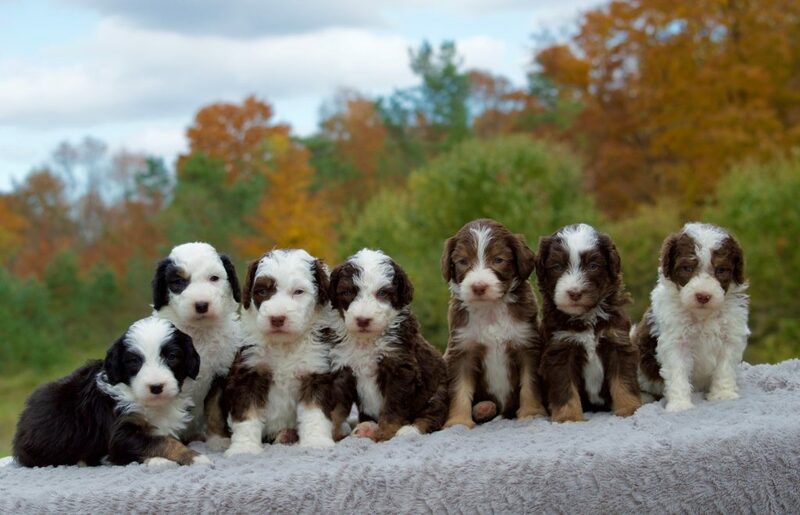 What a gorgeous litter of pups!! 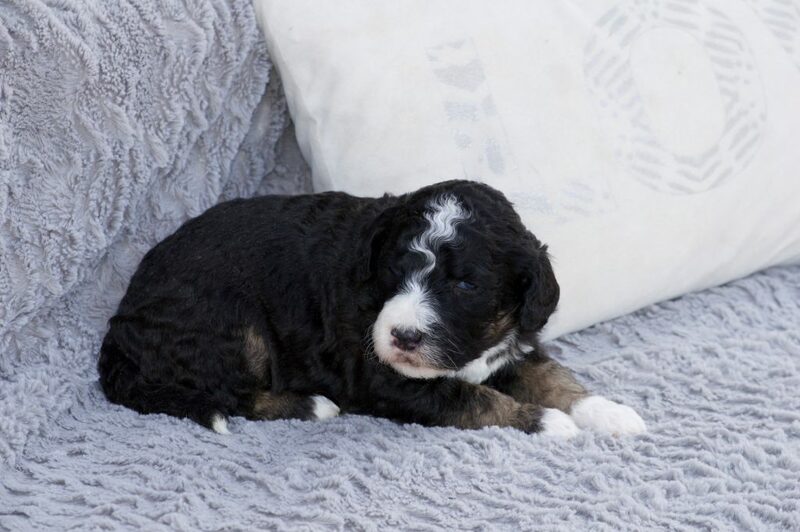 What a lovely surprise to see chocolate and white sheepadoodle pups! 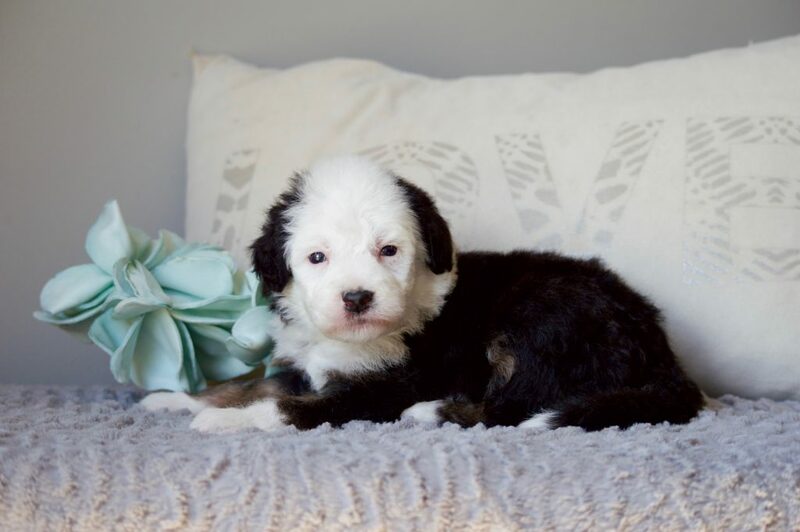 This litter has it all! 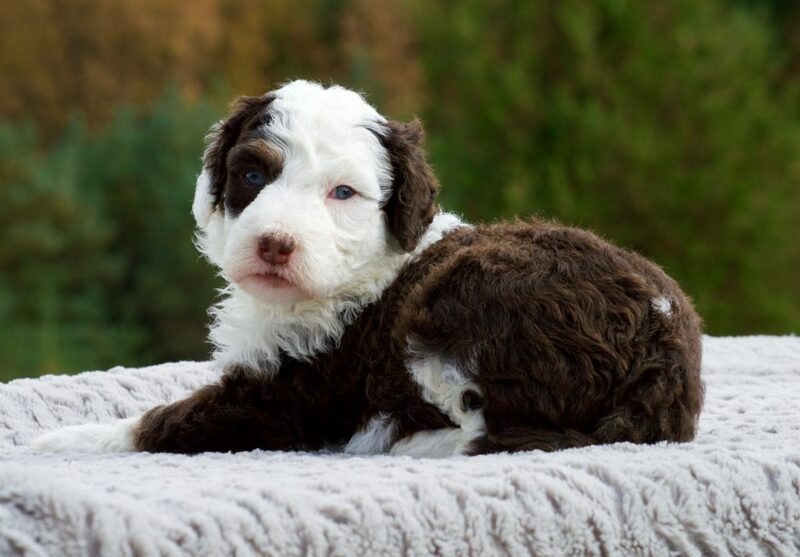 Dark or light chocolate and white pups, with or without tan markings in the tuxedo coat or parti coat, eye patches, choices of curly or wavy hair, black and white tuxedo coats also with the phantom tan markings and a variety of boys and girls. 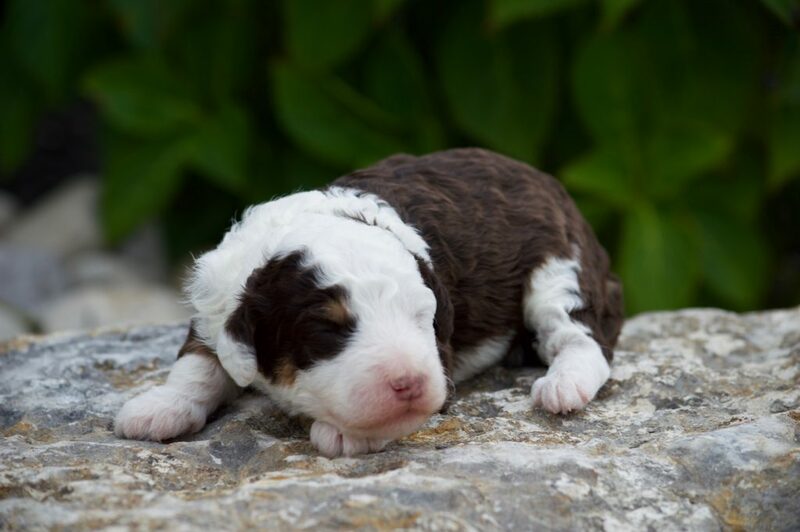 This is a WOW litter. 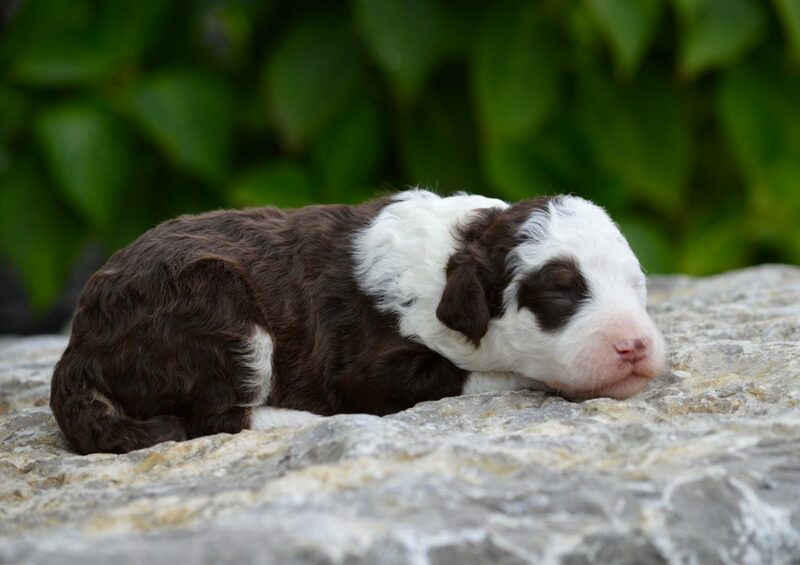 These pups have the easy going, big dog personality but in a medium size. They should be around 45 – 50 lbs matured. So a nice size to manage. Mom and dad both have pleasant, people pleasing personalities and I expect the same of the pups. Both Missy and Wrigley have passed their health testing with flying colours! They both have good OFA hips and Normal OFA elbows. 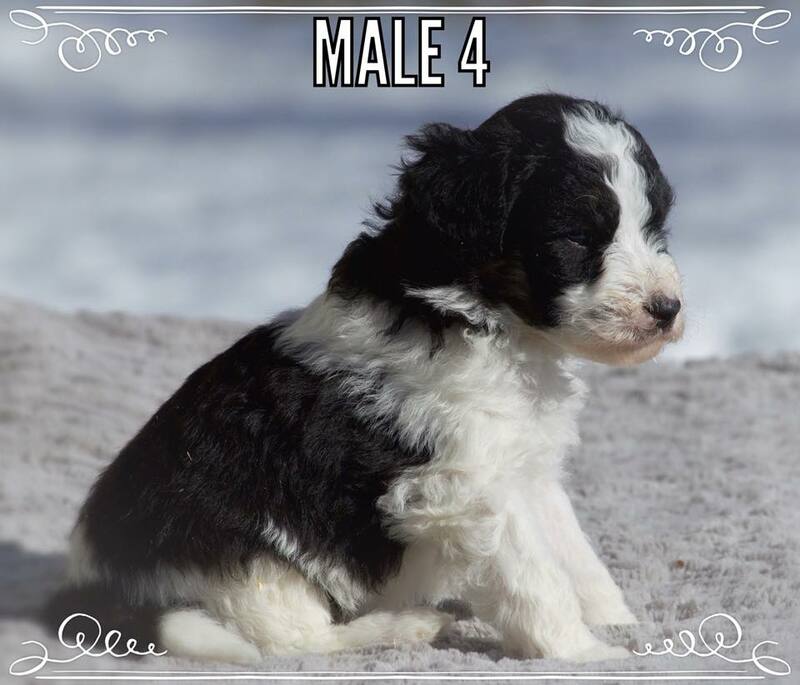 We have openings available in this litter as it is a larger sized litter. Feel welcome to contact us and put your name on our waiting list for either one of these potential pups or a future litter. 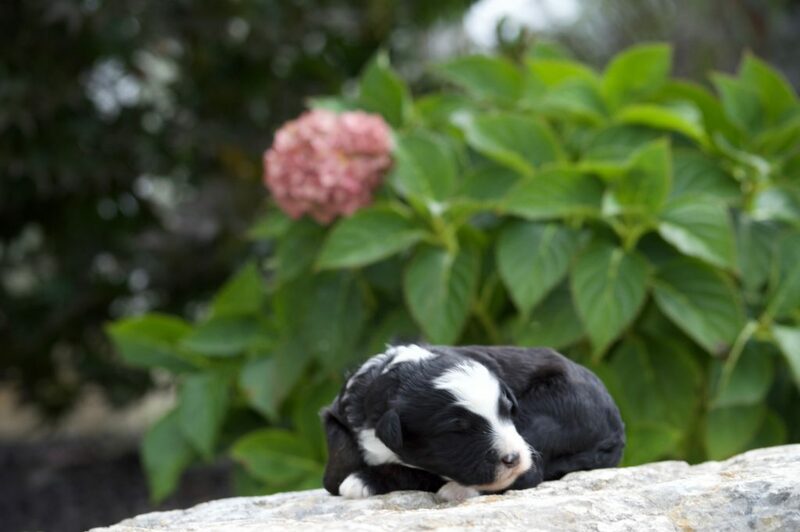 Puppy picking will happen around 6 weeks of age starting with those on our waiting list who have put down a deposit. People pick in order deposits were made. 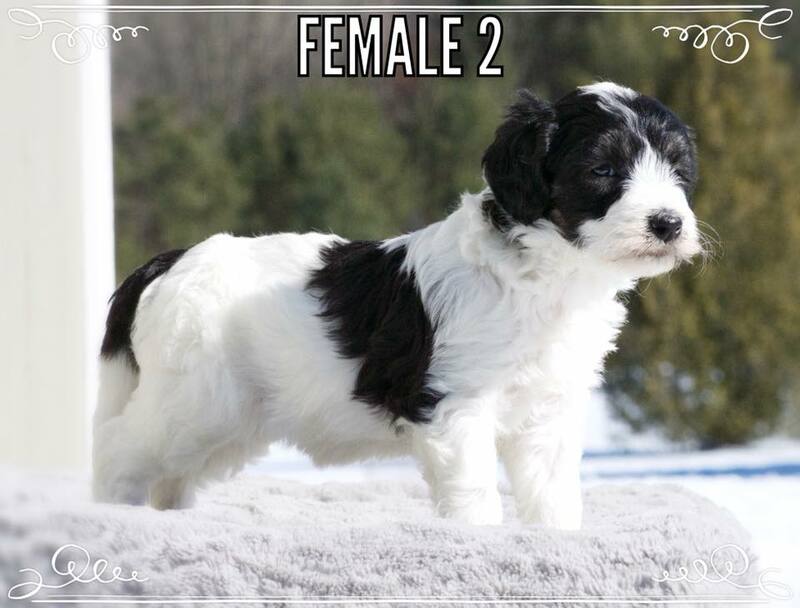 Gender is confirmed at puppy picking. 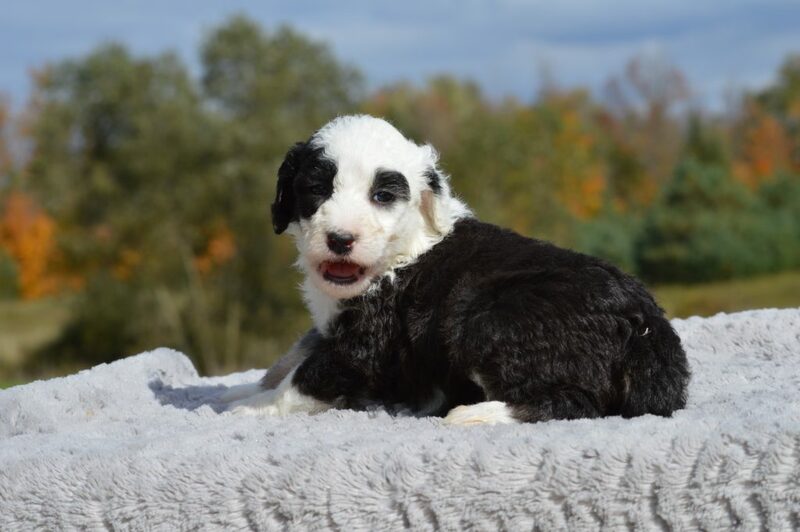 These pups will be ready to go home after they are 8 weeks of age, November 5, 2018 or after. 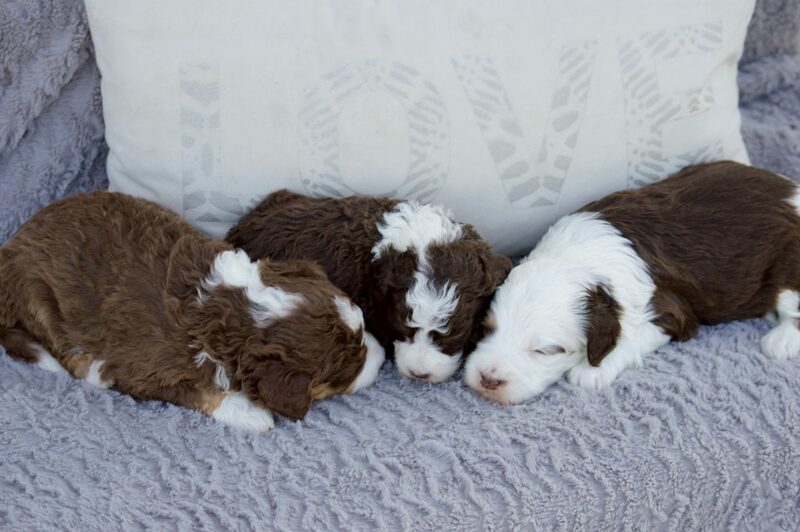 These pups are priced at $3,000 (taxes included). 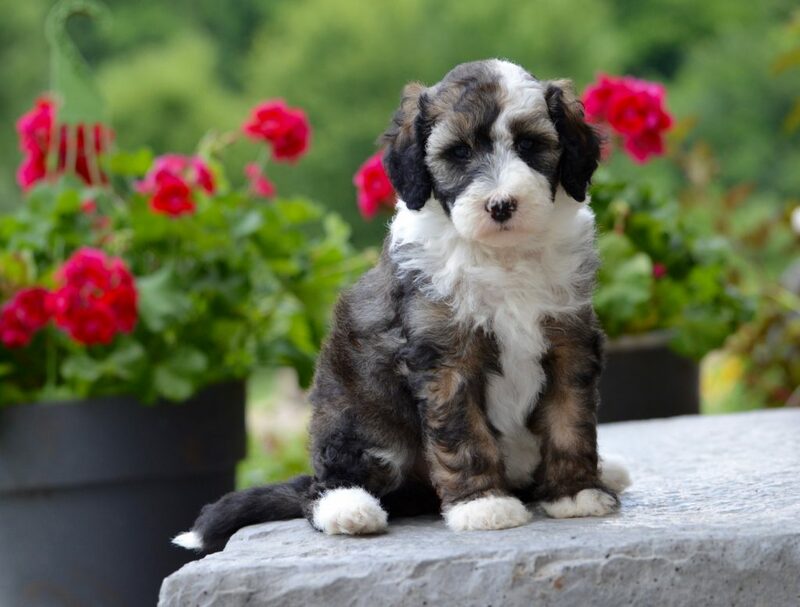 Brown pups are an additional $500 since they are rare – try find a brown and white sheepadoodle! They come with a 1 year all inclusive genetic health guarantee on any life threatening genetic illness. This can be upgraded to a 2 yr health guarantee with enrolment to our NuVet Plus Vitamins. The pups will be vet checked and approved before they go home. They will also have several rounds of deworming treatments. In addition to this, they will go home having been well loved from day one! 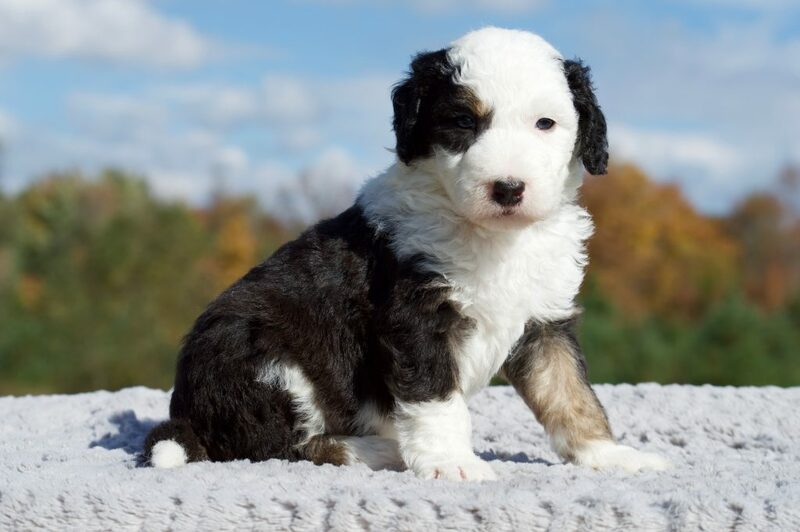 Contact us if you are interested in one of these pups or one like it in the future. 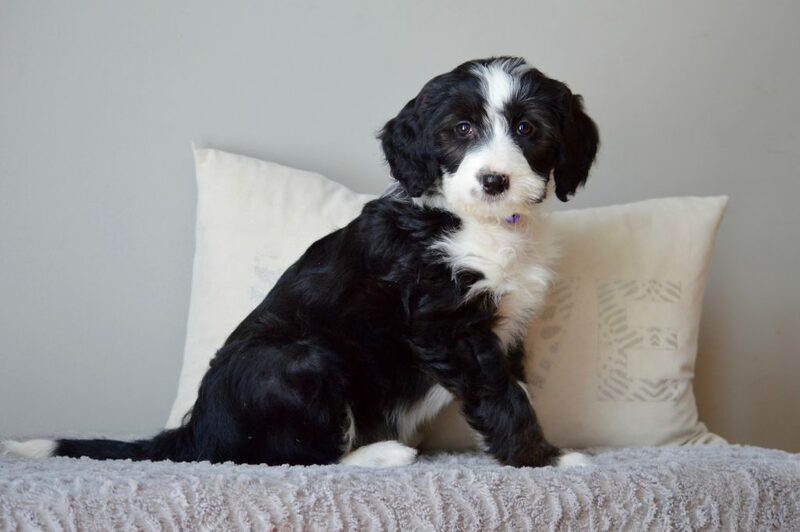 Photos and Instagram pages of Missy x Wrigley’s past litter of pups from Feb 2018. Also a testimonial from August 2018 on one of the pups. There is no such thing as a short walk when I go anywhere because we get stopped so often. In Whistler especially where there are so many tourists milling about, people are constantly asking me about her. She loves everyone of course, unreservedly. 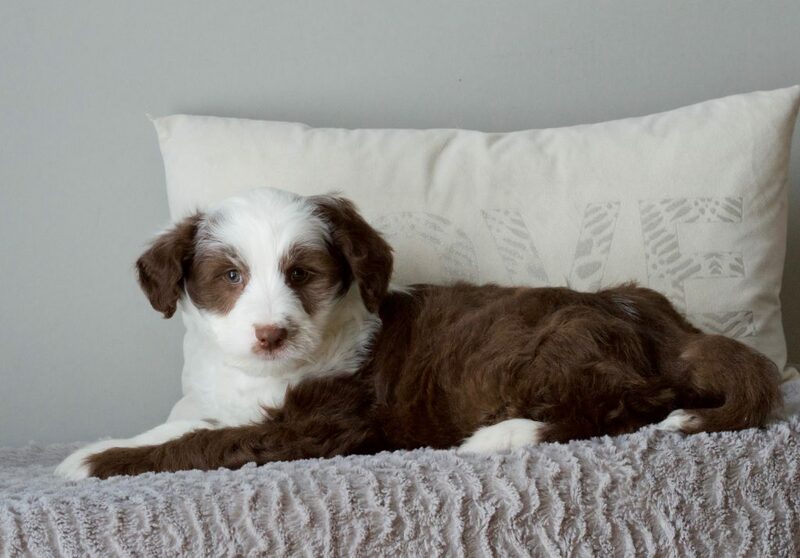 Also – everyone remarks on what a calm puppy she is. She has an extraordinary temperament. She is a beautiful, beautiful dog and I’m so happy again. Thank you so much for bringing this amazing creature into our lives. It was absolutely meant to be. Just wanted to send a couple of pics of Cooper. He has adjusted amazingly. Took to his crate the first night, about a months worth of potty adventures, and no chewing on anything resembling furniture. 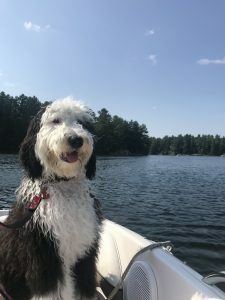 Just returned from the cottage where he absolutely loves the water. Also, took a chance having him leash free, but he was more concerned about losing us than we were of him. So far so good. 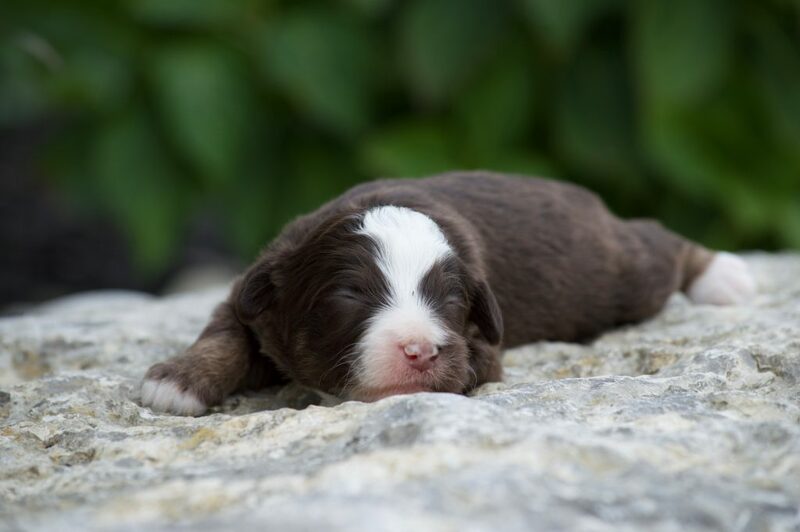 Thankful that more of these amazing pups have joined our world! 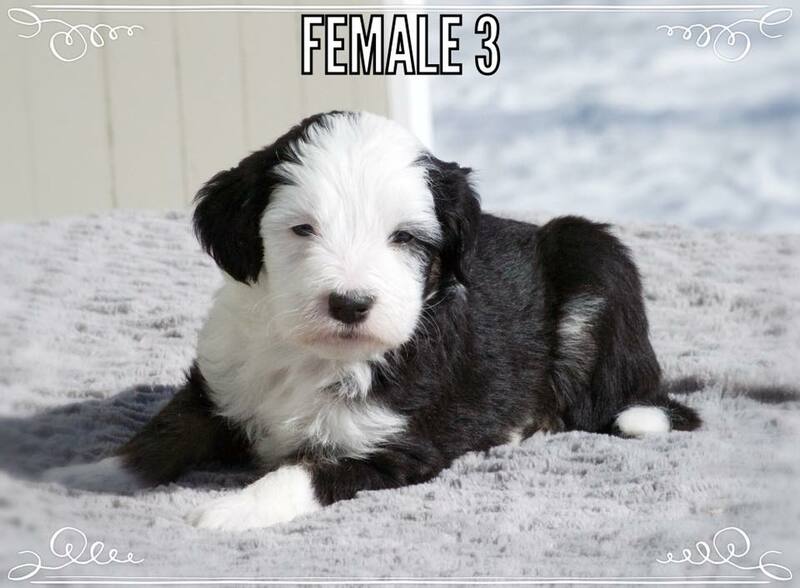 Piper x Wrigley have another beautiful litter of F1b Moyen Sheepadoodle puppies! 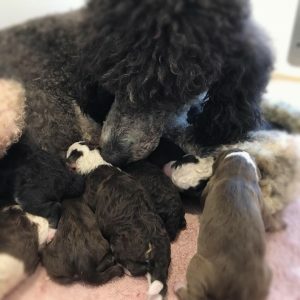 We have nine healthy puppies – 5 Boys and 4 Girls! 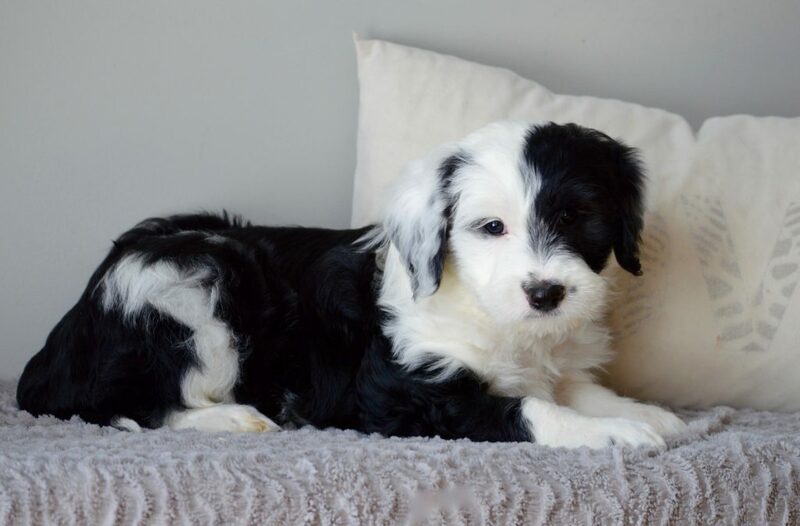 Each with unique markings in black and white and even sable! We have some straighter/wavier coats and some curlier/wavy coats. You can see pictures and videos on our Instagram page! 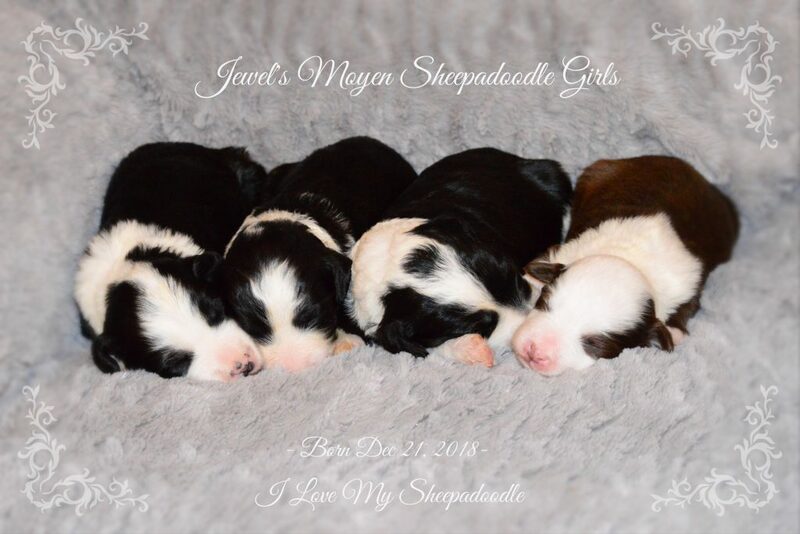 We are excited about this litter of Moyen Sheepadoodles. Piper is so sweet and gentle. Everyone who meets her is captured by her kind demeanour. 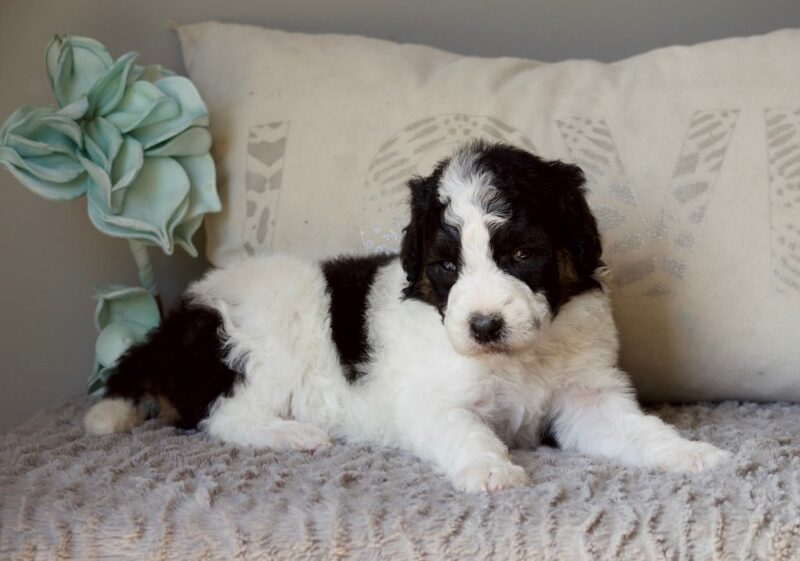 She is a smaller Standard Poodle weighing about 38 lbs. This will be Piper and Wrigley’s second litter of puppies. 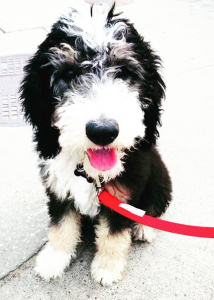 Wrigley, our Mini Sheepadoodle stud, weighs in at 40 lbs and is such a charmer! 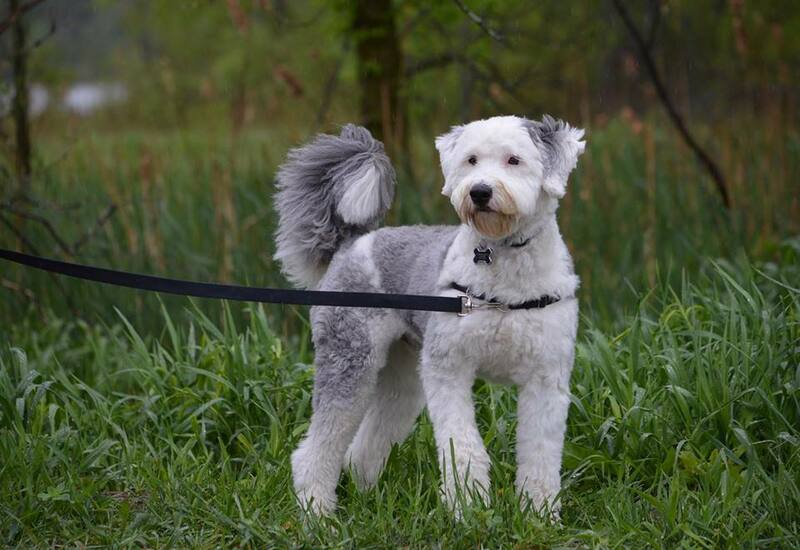 His handsome looks stop most people dead in their tracks begging for a pet and asking what kind of dog he is – of course Wrigley is always happy to get some attention and soaks it all in. 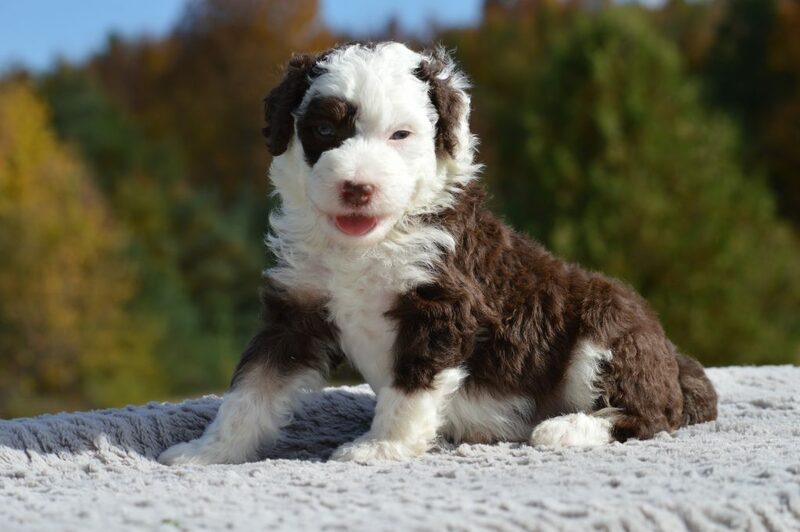 These puppies should have amazing temperaments if there are anything like their parents! 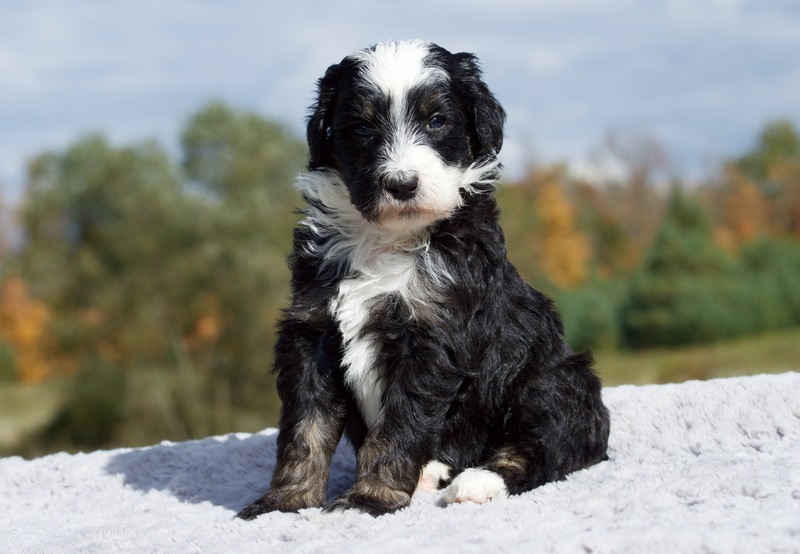 For coats, we expect some pups with curlier coats and others with wavy coats. Their sizes matured should be around 40 lbs. 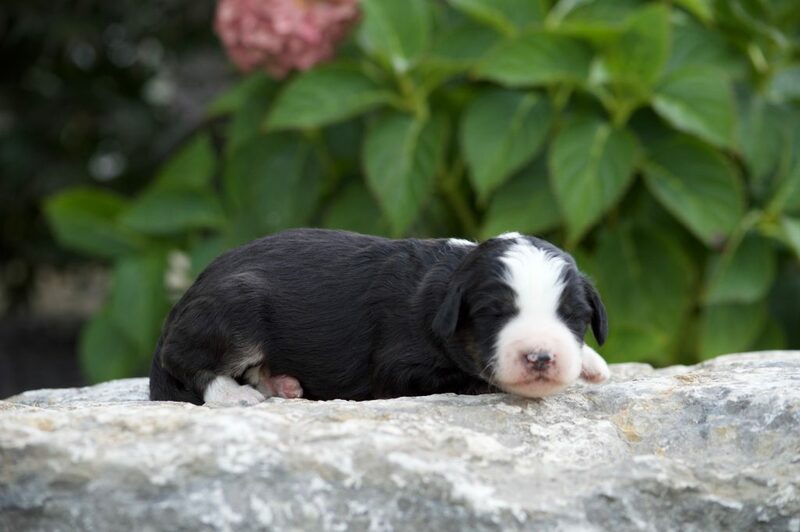 Below are some photos of past puppies. 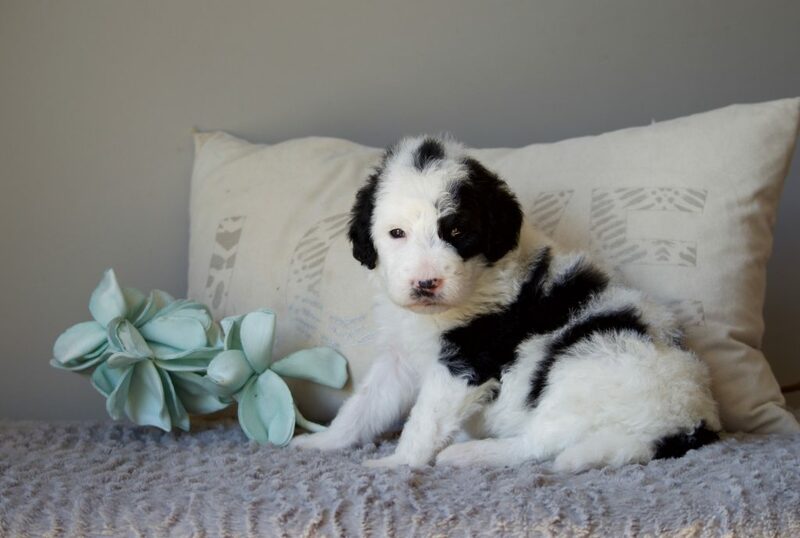 This litter is reserved for those on our Moyen Sheepadoodle Waiting List. 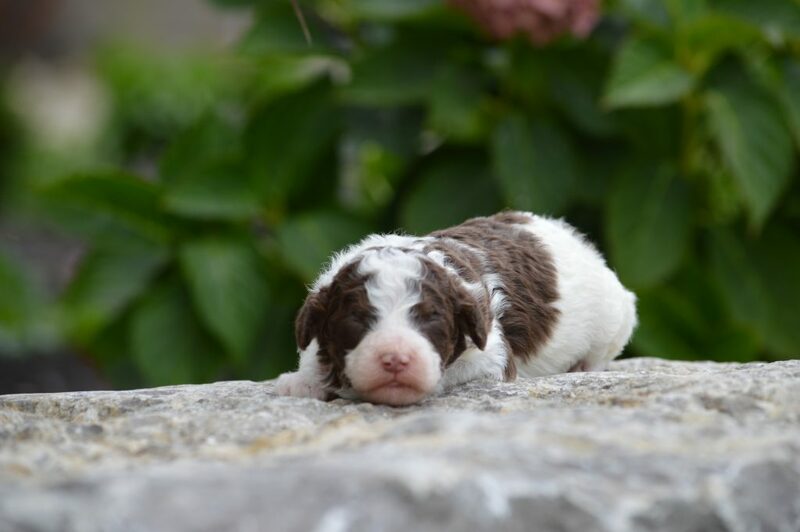 If you are interested in a pup like this contact us to join our waiting list for a future litter. 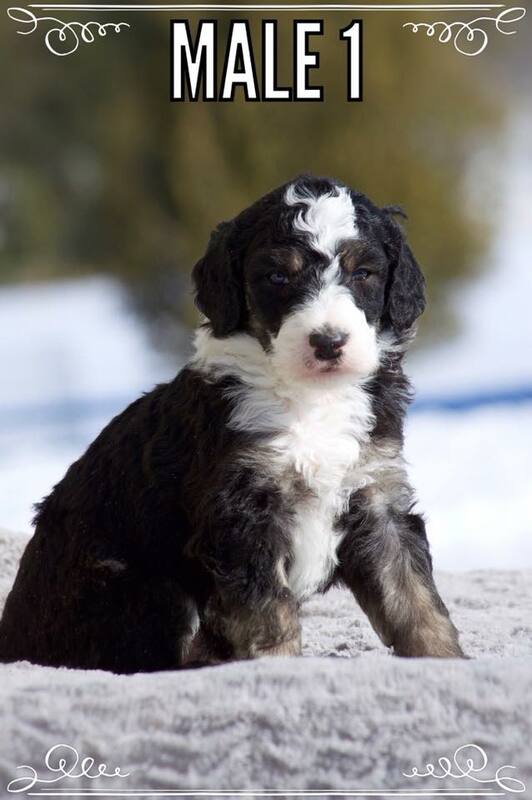 The Moyen sized Sheepadoodle is a cross that Cranbrook Family Dogs has designed using a F1 Mini Sheepadoodle Stud (40 lbs) with a Smaller Standard Poodle. We created this size to provide for those looking for something a little smaller than the Standard size. 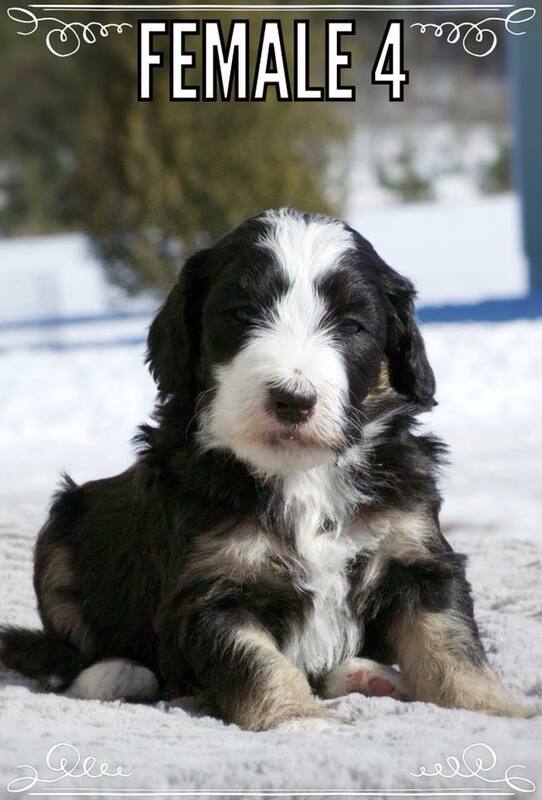 The Moyen Sheepadoodle should shed even less then the already hypoallergenic F1 Sheepadoodle. 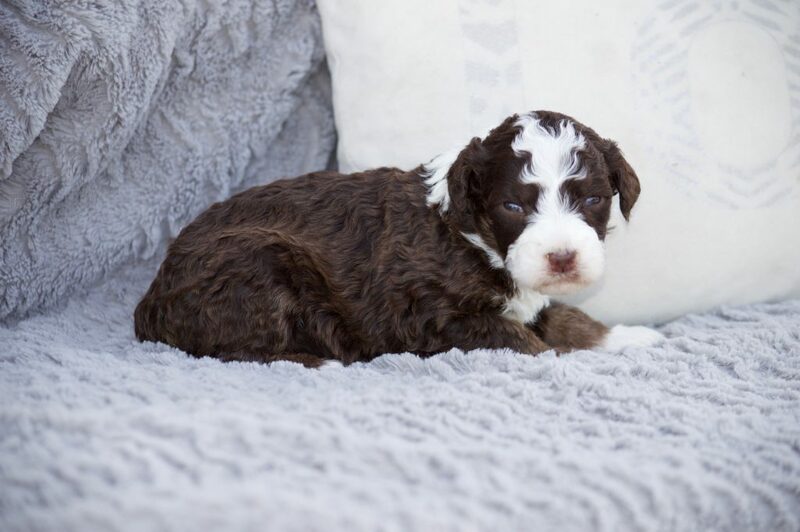 Some of the pups will have curlier coats in the litter and others will have the wavy look. You can have a variety of coats within the litter. 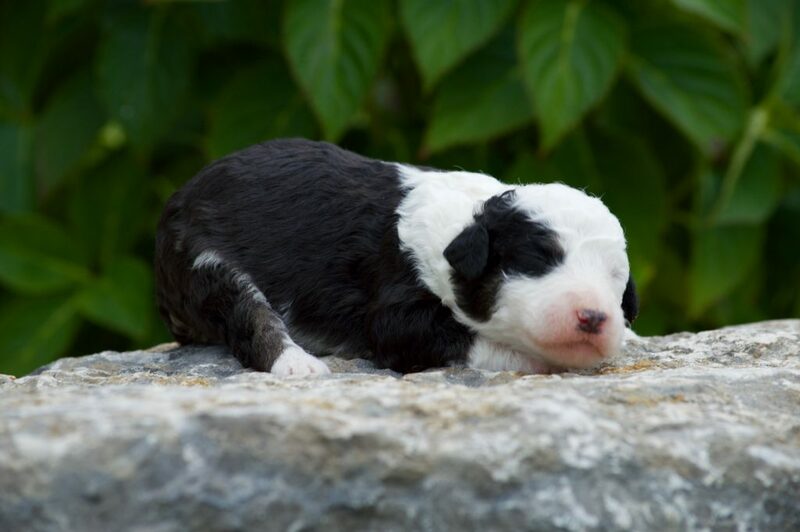 The pups will have the black and white markings. 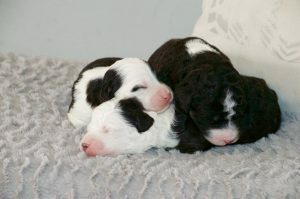 These pups will also have a better chance of staying black and white and not going grey and white. 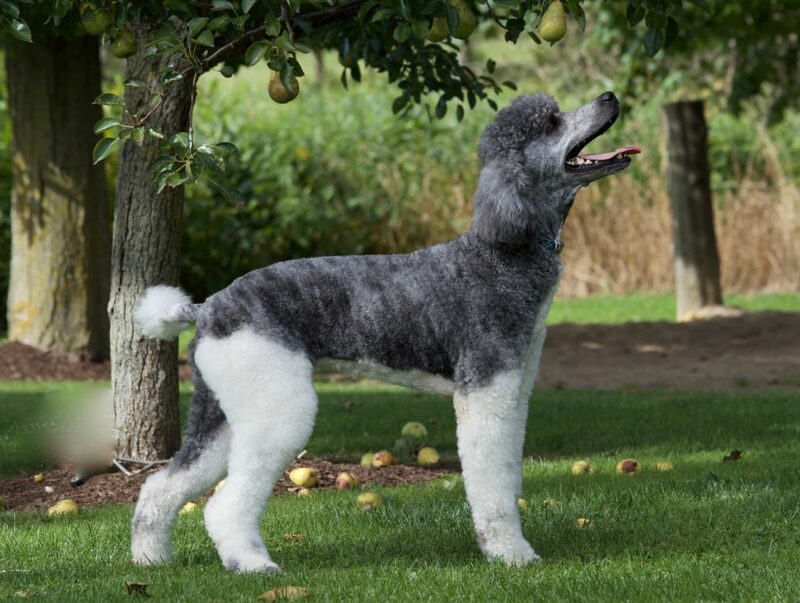 The term MOYEN comes from the poodle world. It means medium in French. 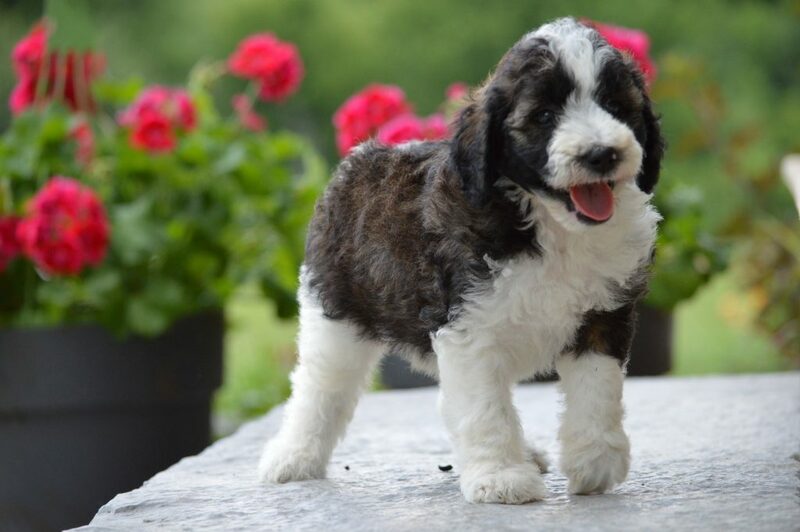 The Moyen Poodle is the poodle size of about 30-45 lbs, right in between the Standard and Mini sized poodles. 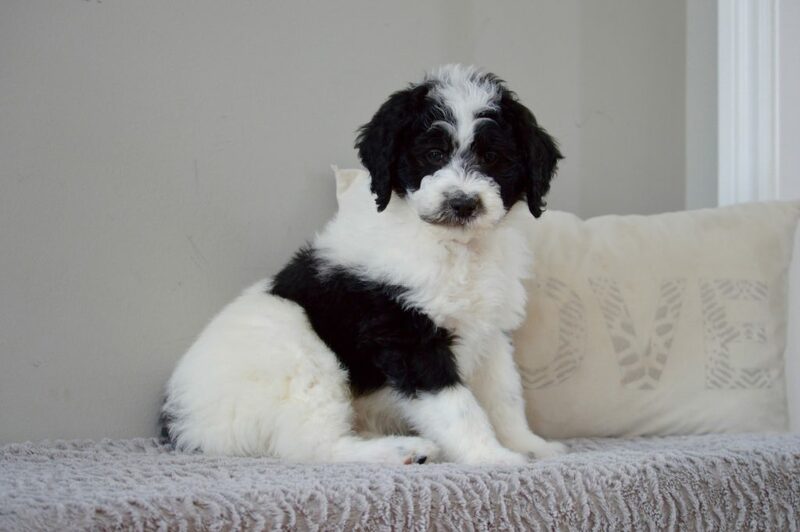 To create the Moyen Sheepadoodle we will generally have a Mini Sheepadoodle Stud crossed with one of our Standard Poodles. 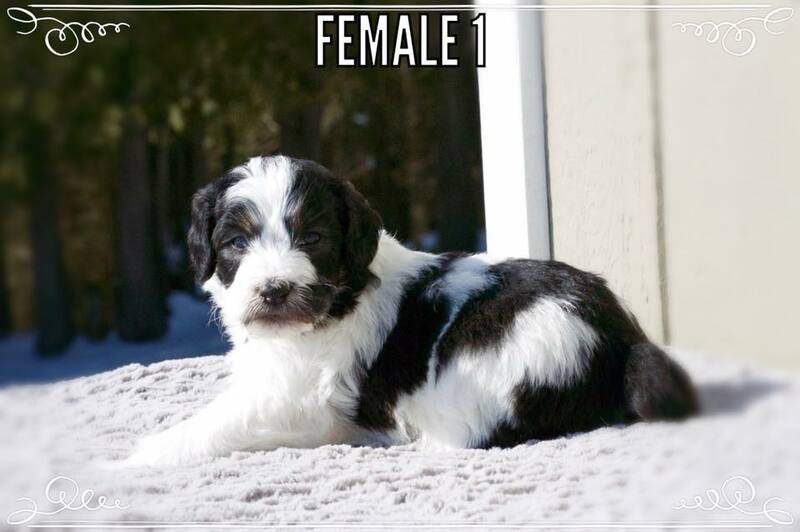 These Moyen Sheepadoodle pups should mature to around 40 – 45 lbs. 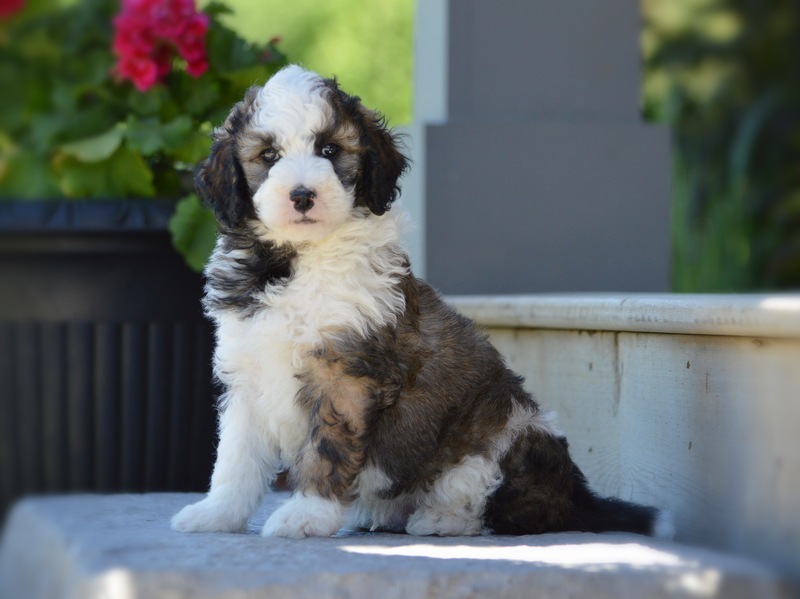 What a great size for the younger or older folk … another perfect family pet! have friendly outgoing personalities. They love life and are up for play anyway, but also will hang out and chill for some snuggle time. We expect the same from their pups. 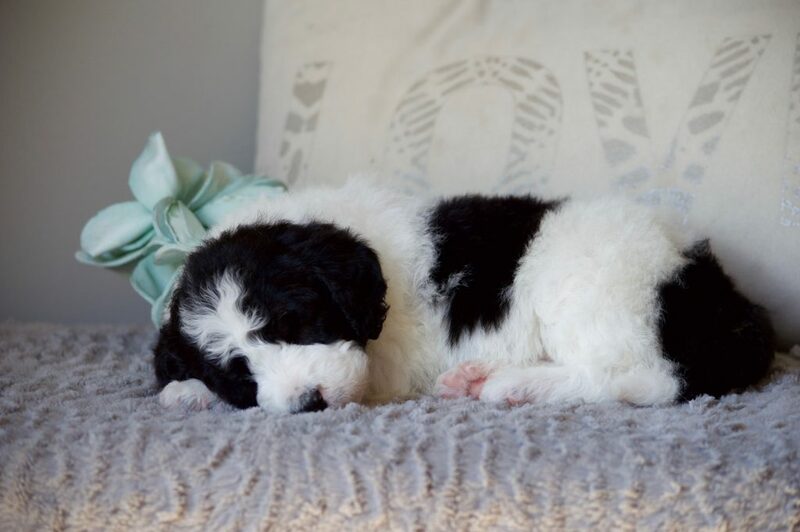 We look forward to another litter of amazing Sheepadoodle pups from Wrigley and Jewels later this February 2018. 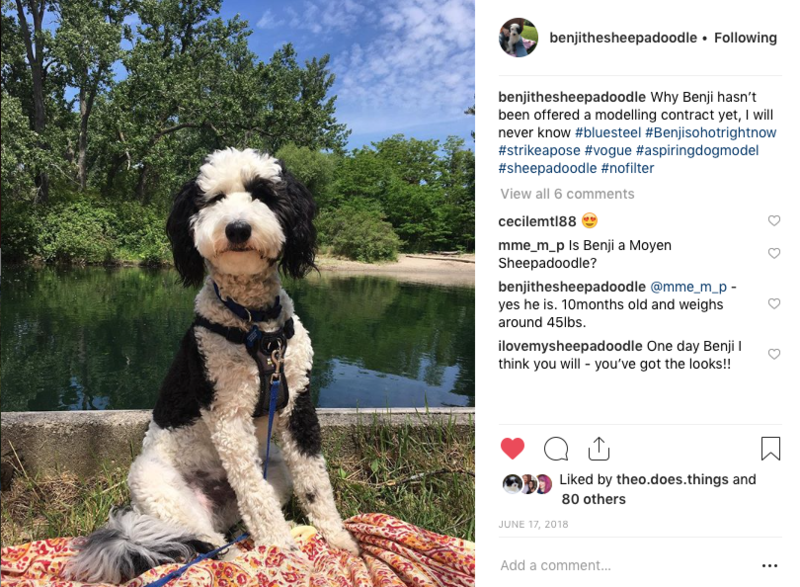 Here is a link to one of their pups from last litter – BenjitheSheepadoodle is on instagram! Jewels x Wrigley had 7 puppies Tuesday morning, February 27th. 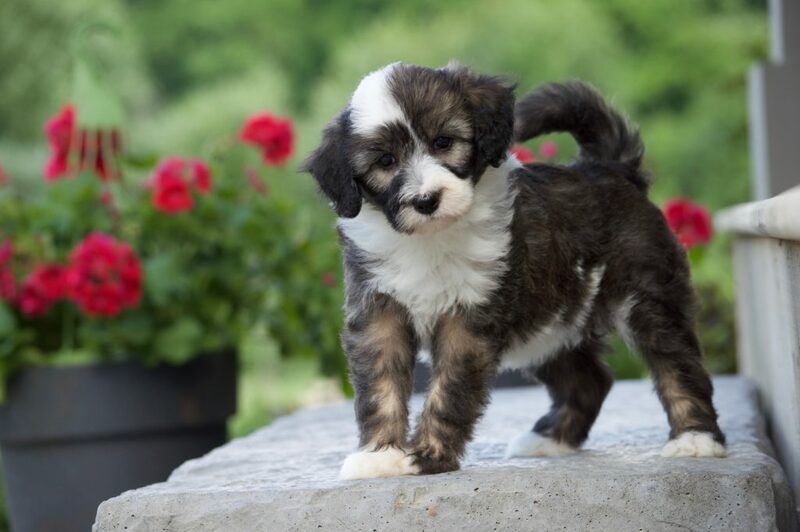 All pups have black and white tuxedo coats. It looks like most of these pups will have a wavy fluffy coat. These pups will be low to non-shedding. They should mature anywhere between 40-50 lbs. 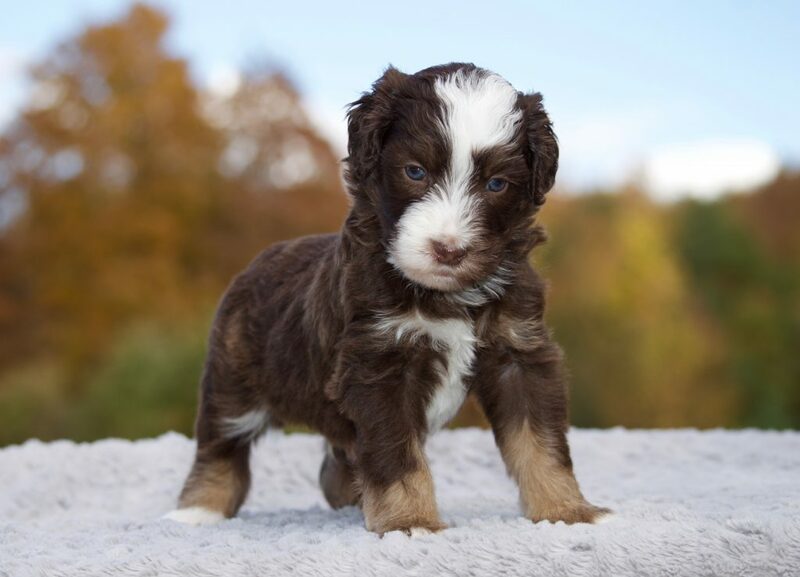 Sometimes there will be a smaller pup or larger pup than this in the litter, but this would be the expected average. 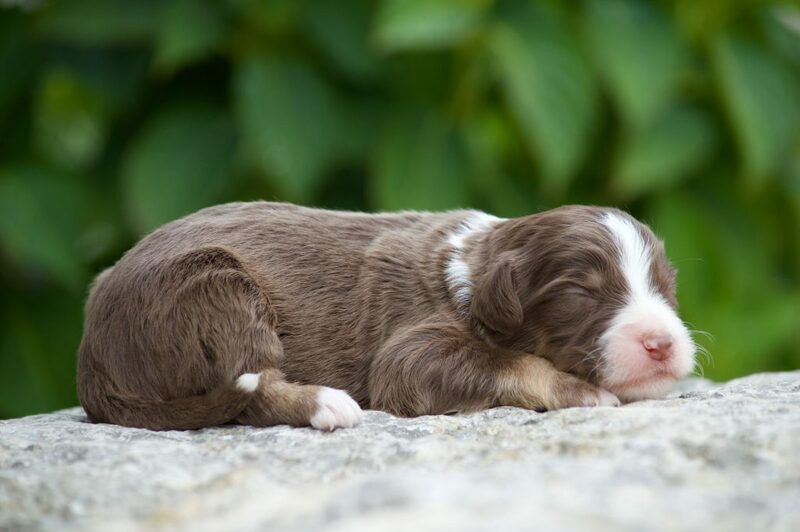 Jewels is our most energetic dog so I expect some of these pups to have more energy as pups. Jewels is also VERY sweet and affectionate so these pups will love to play and exercise but also hang out and soak in the love. 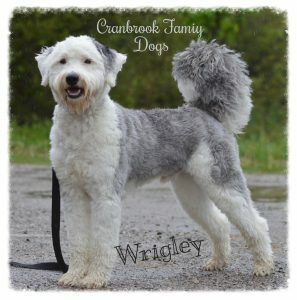 Wrigley, their father has a beautiful thick fluffy coat. 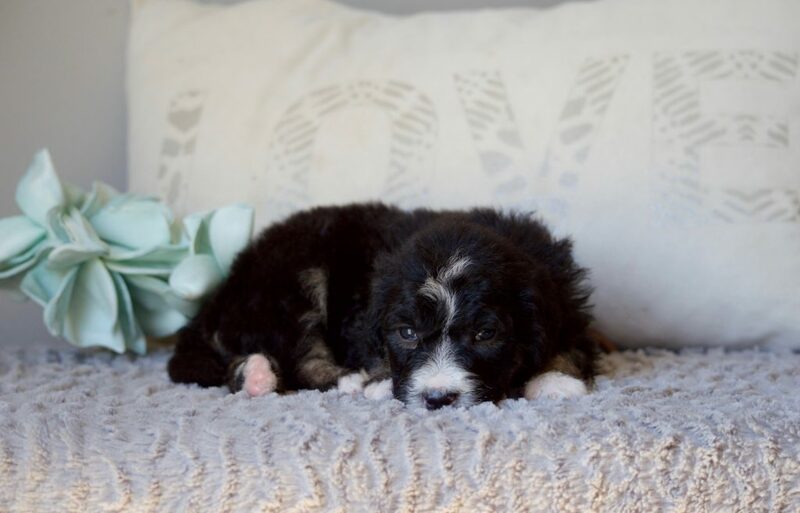 He is playful, goofy and fun loving, and yet is a gentleman and a great family dog. 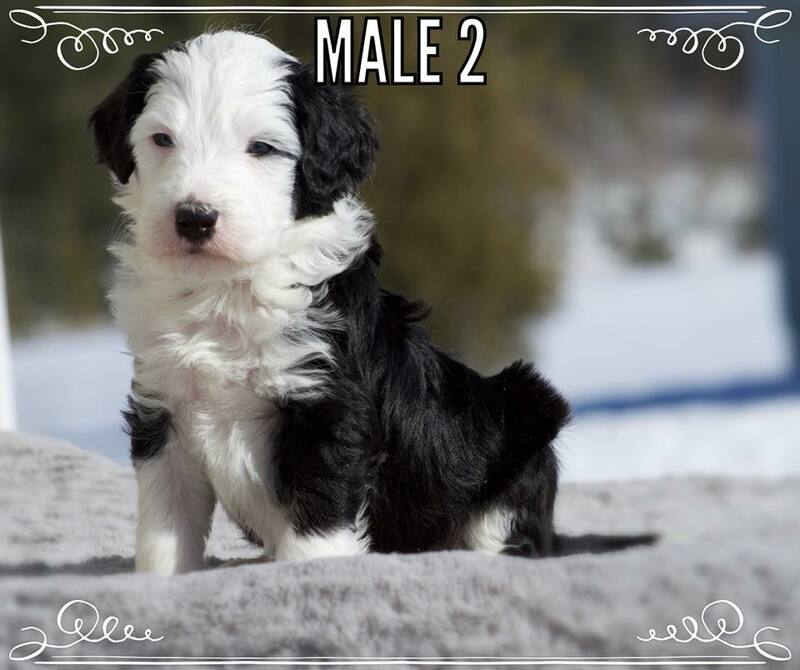 These pups are reserved for those on our Moyen Sheepadoodle waiting list. 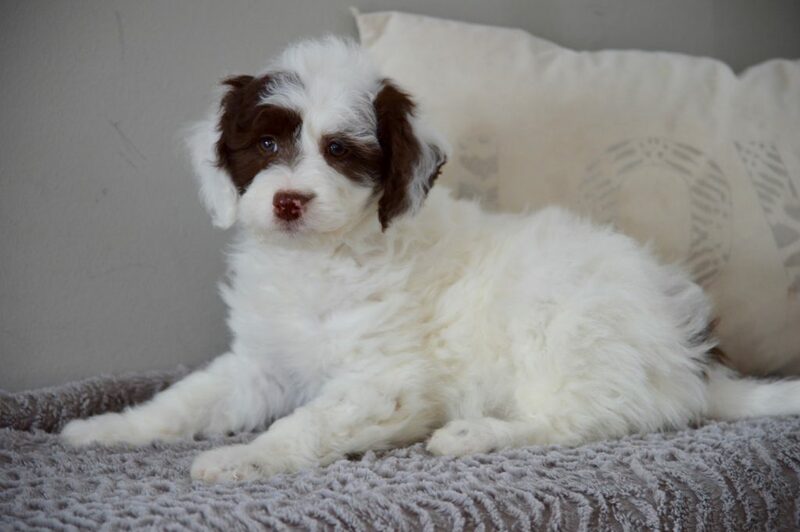 We will let people pick their pup around 7 weeks of age. 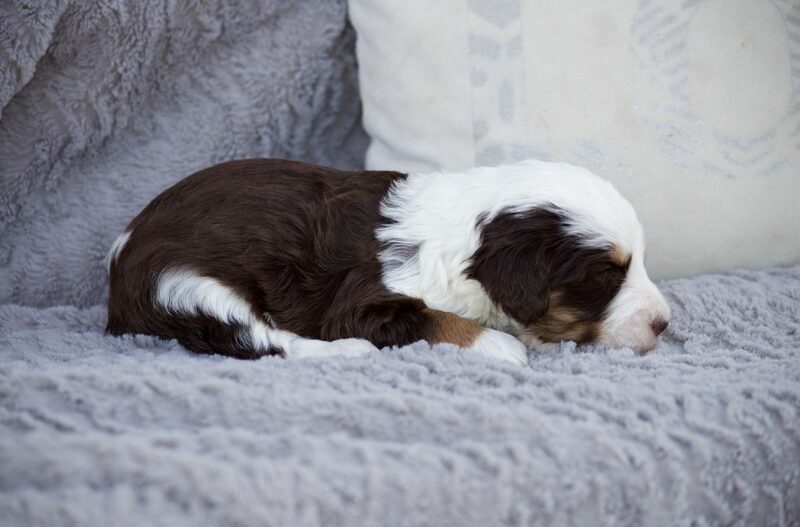 The pup can go home between 8 and 9 weeks of age. They should be ready to go home April 24 – April 30, 2018. More pictures to be posted at around 4 or 5 weeks. Videos will be posted on Facebook around 7 weeks of age. 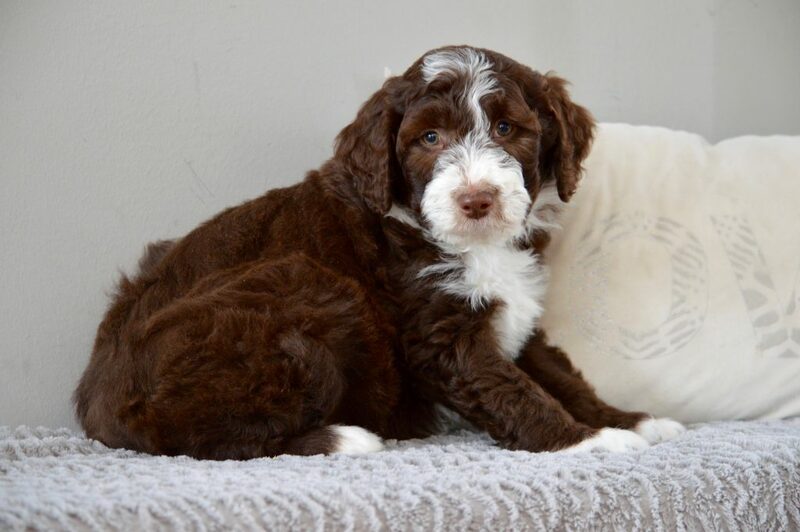 This will be Missy x Wrigley’s first litter of Moyen Sheepadoodles. Missy is a calm, well mannered purebred Poodle. 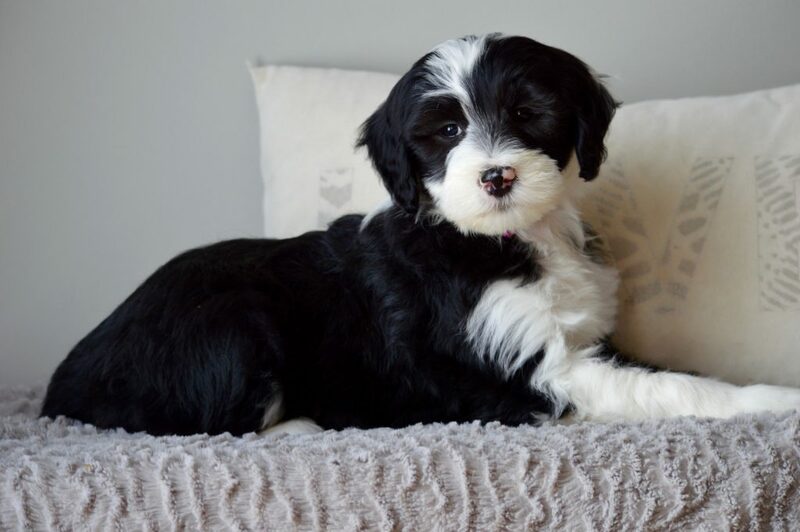 She is definitely a favourite! 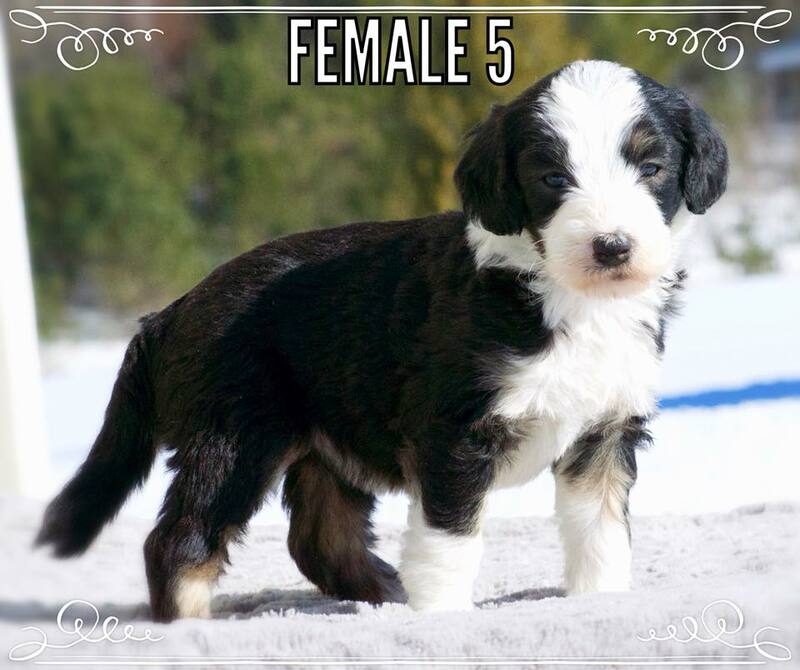 She is around 55 – 60 lbs. 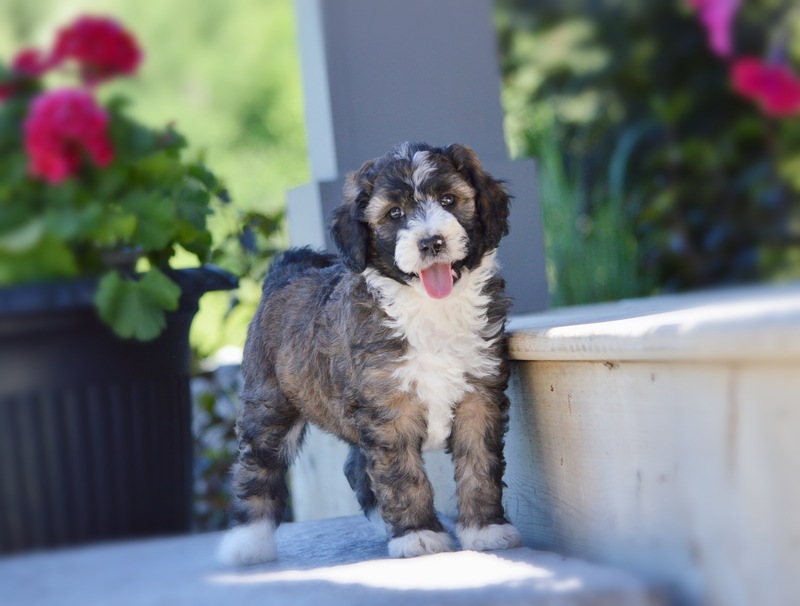 Wrigley is our gorgeous Mini Sheepadoodle stud that trumps all other studs!! He weighs in at 40 lbs. He is a gentleman with a touch of goofiness at times. 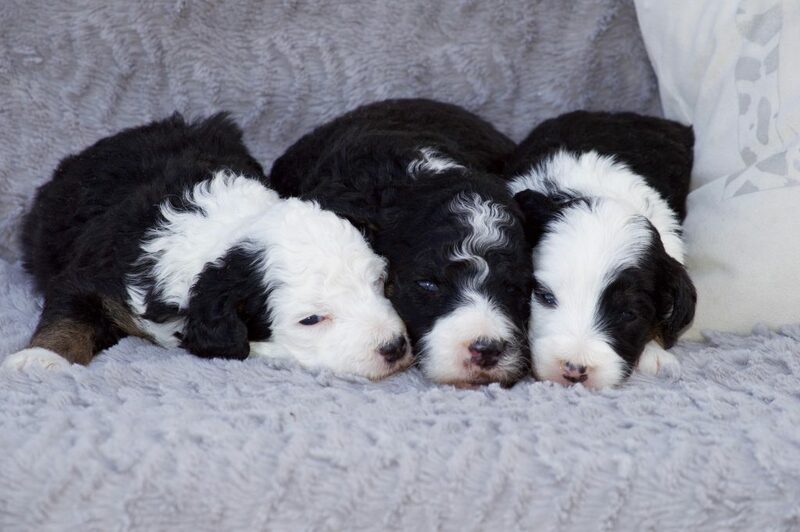 These Sheepadoodle pups will be F1b Sheepadoodles and are hypoallergenic. 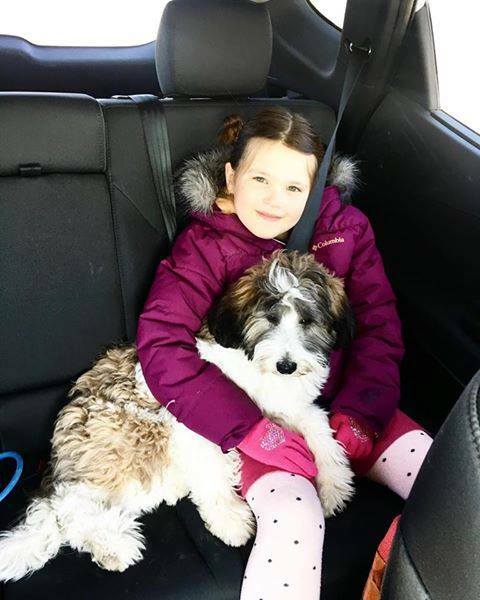 Wrigley lives with a foster family that has allergies within the family, but they have no problems with Wrigley! 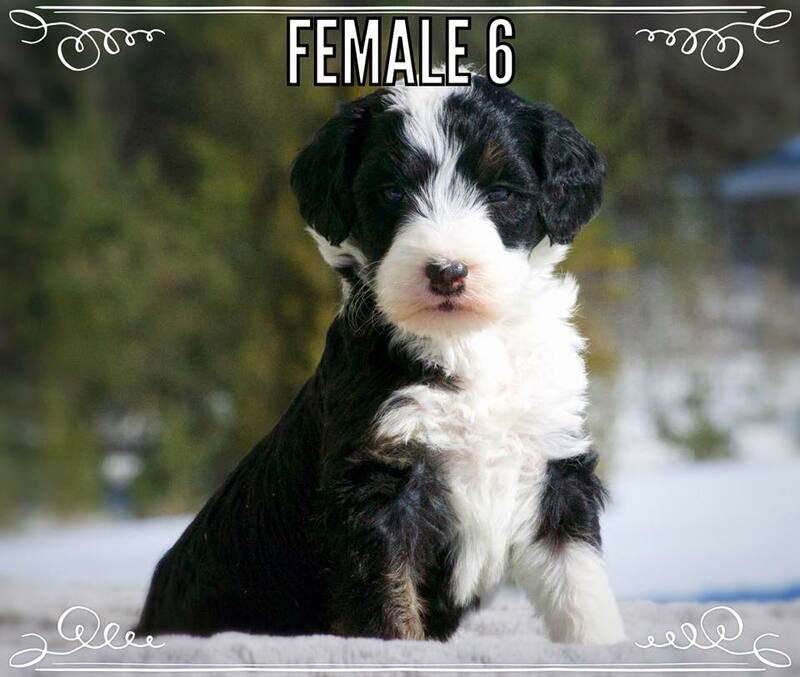 These pups should mature to around 45 – 55 lbs, a medium sized dog, hence the Moyen Sheepadoodle name. 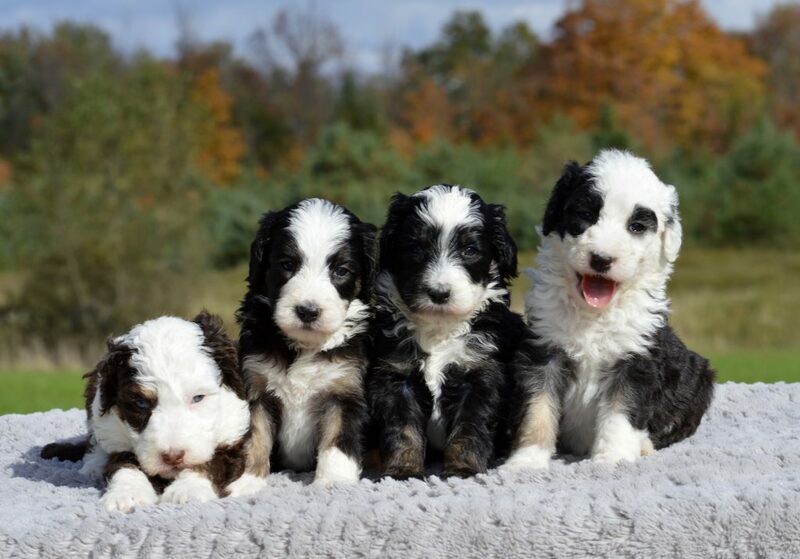 These pups will make a great family pet! The F1b Sheepadoodles will be less play nippy than the F1 Sheepadoodles. 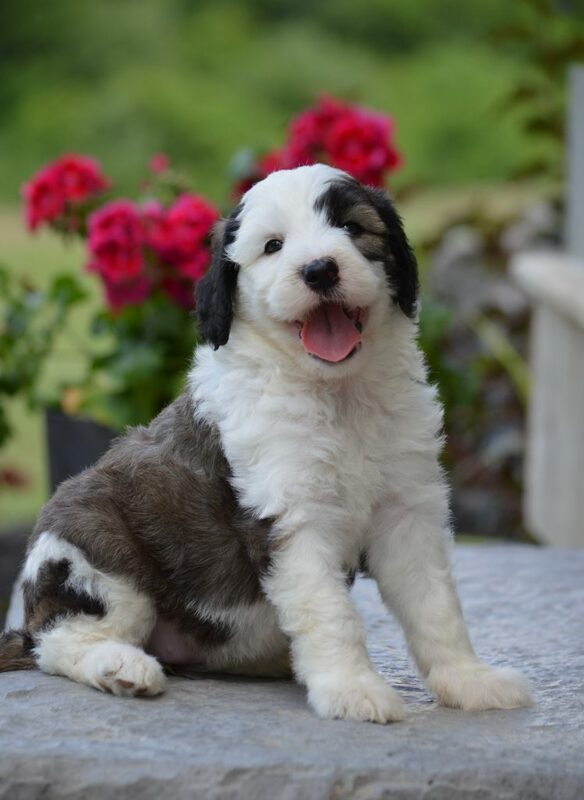 Also the size is easier for children or for people who are not able to handle a larger sized dog. We love this size and are happy to be able to produce such lovely Sheepadoodles! 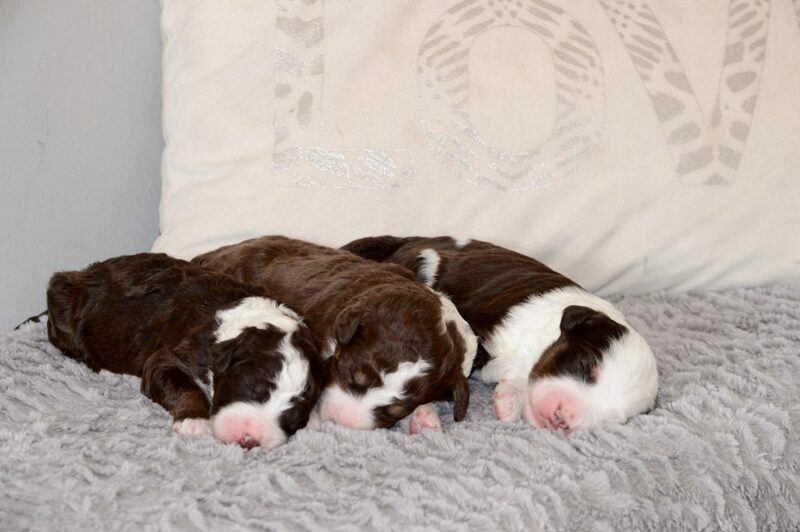 These pups are priced at $2,500 plus HST. 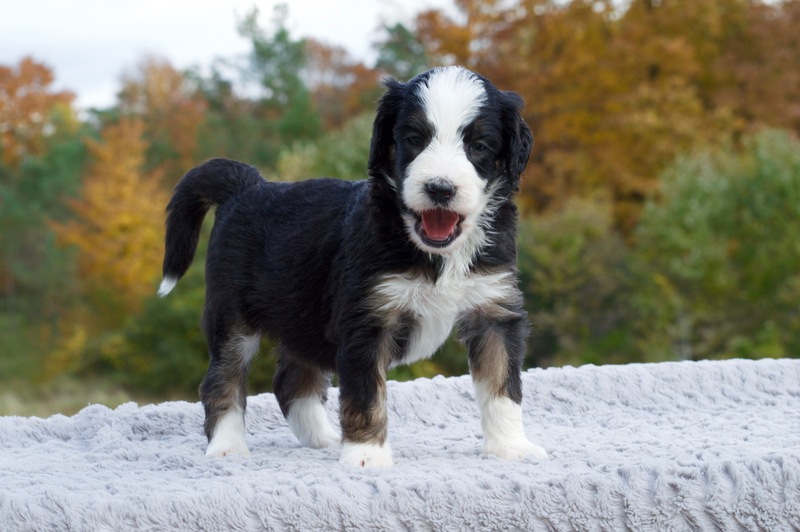 Puppies are chosen around 7 weeks of age when their personalities come out. We will go through our waiting list. Pups are picked in the order of deposits made. 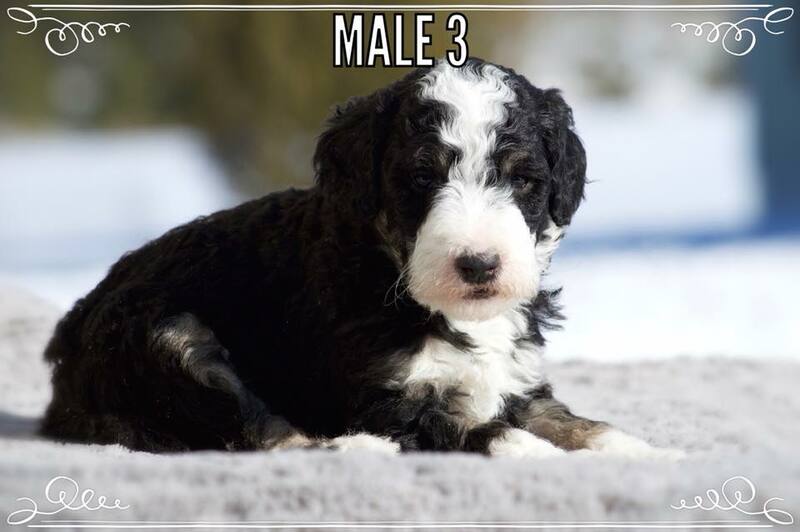 These pups are reserved for those on our Moyen Sheepadoodle Waiting List. 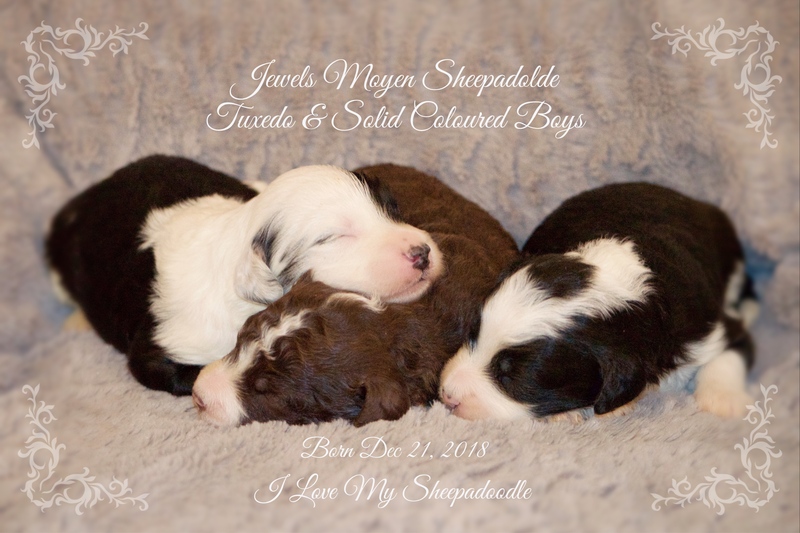 We are excited about our next litter of Moyen Sheepadoodles. Piper is so sweet and gentle. Everyone who meets her is captured by her kind demeanour. 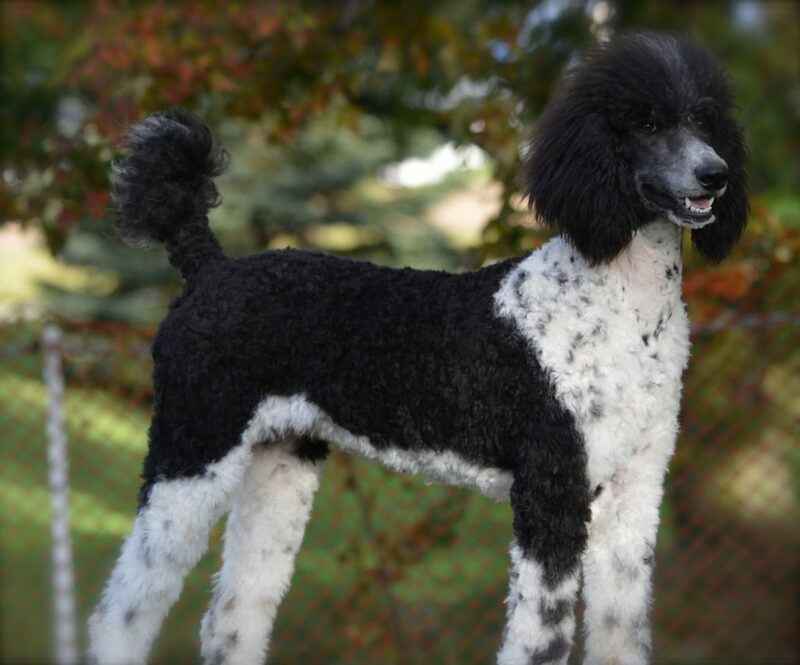 She is a smaller Standard Poodle weighing about 38 lbs. 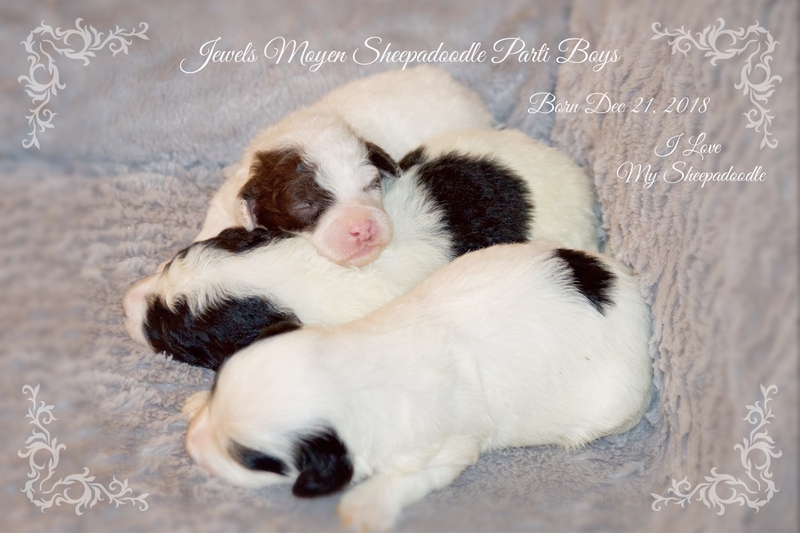 This will be Pipers first litter of pups. 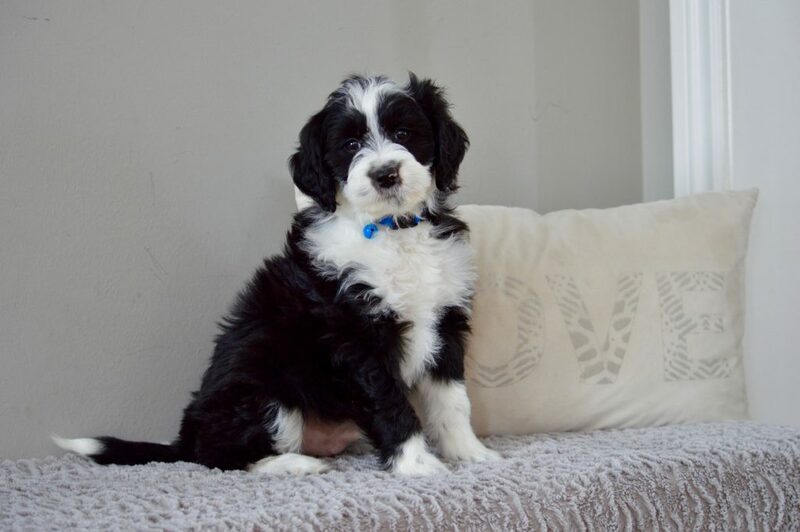 Wrigley, our Mini Sheepadoodle stud, weighs in at 40 lbs and is such a charmer! 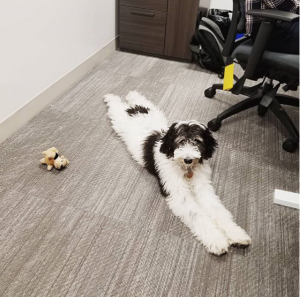 His handsome looks stop most people dead in their tracks begging for a pet and asking what kind of dog he is – of course Wrigley is always happy to get some attention and soaks it all in. 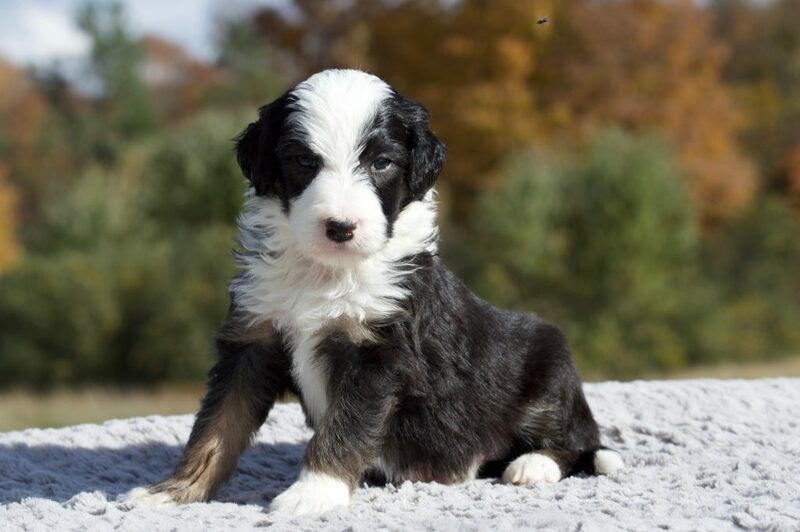 These pups should be amazing for temperament and looks. Their size should be around 38-40 lbs matured. 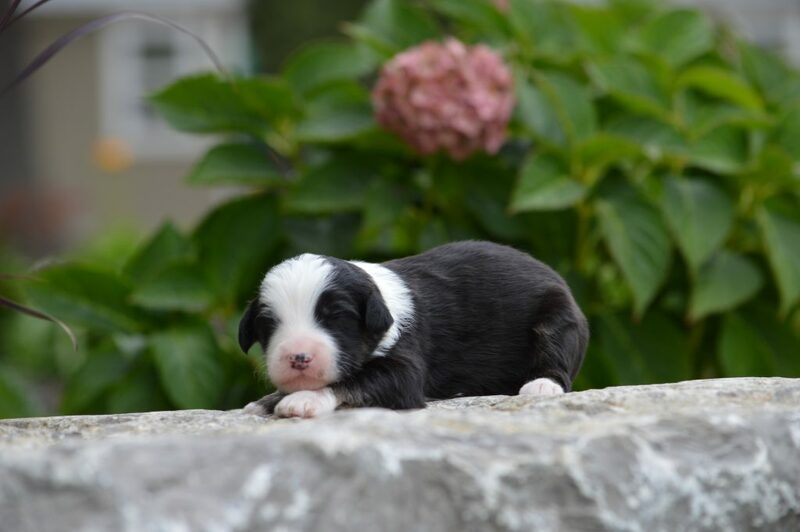 I expect these pups to all be grey and white when they have their adult coats. 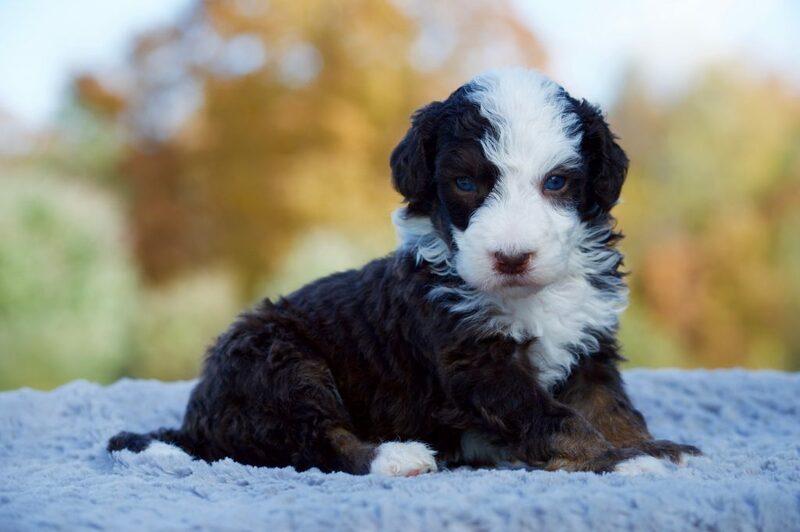 Some pups will have curlier coats and others will have wavy coats. These are top notch pups! Pups all SOLD.